Come Step Back In Time – Discover a passion for history…. 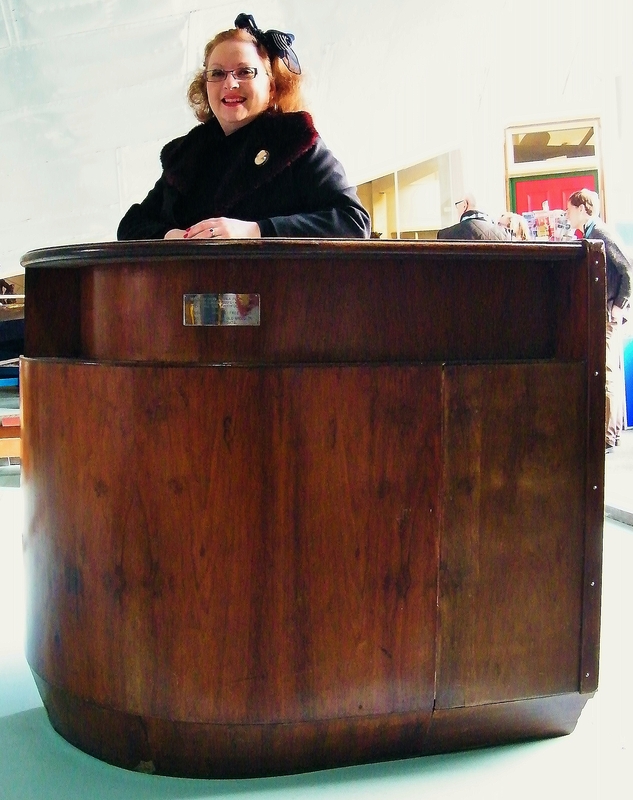 End Of An Era …..
Me in top aft cabin of Beachcomber with photo of Maureen O’Hara. Stills from BBC One’s, Inside Out South East’s ‘Sultan and The Showgirl’, 1930s set drama-documentary. I was an expert contributor. October, 2015. 1960s selfie at Goodwood Revival 2015. My grandfather’s story featured in Hengelo’s Weekblad newspaper (24.3.2015, p. 15 – http://www.hengelosweekblad.nl). Thanks to all the hard work by historian Eric Heijink! Selfie at The Wallace Collection. Having great fun with broadcaster and media specialist, Di Evans. Image courtesy of the Reel Media Deal. Me with Chef Adam Gray and presenter/musical theatre star Craig Price. Image Courtesy of Craig Price. With Michelin Chef Adam Gray doing our food history homework at the Skylon restaurant, London. Chef Gray brought his 1869 copy of Mrs Beeton’s Book of Household Management. Image courtesy of the Reel Media Deal. Lucy Adlington. ©Come Step Back In Time. Pictorial highlights from some of my many blogging joys over the last 5 years of Come Step Back In Time. (More images at end of article). I published my first article on Come Step Back In Time in July 2011 and after 5 incredible years, this post will, sadly, be my last. I have thoroughly enjoyed every second of writing this blog but the time has come to embark on exciting new writing challenges. I am very proud of Come Step Back In Time and the site will remain live for as long as WordPress continues to exist, hopefully for quite some time to come. There are 185 articles on here, most of which are long read. Final word count stands at 280k, equivalent to 3 full-length novels or 3 PhDs, no wonder I have bags under my eyes! At the end of this post, I have compiled a list of my favourite articles from the last 5 years. Regular readers will know, since 2013 I have also written a 2nd blog, Viva Blancmange, dedicated to retro food. Like Come Step Back In Time, Viva Blancmange has also gone from strength-to-strength, attracting a lot of attention from the British media as well as securing a large, global readership. Running 2 blogs in tandem has been a considerable amount of work as you may imagine. Whilst I never shy away from a challenge, I recently made the decision that, going forward, I would retain just 1 blog. I have renamed Viva Blancmange, it is now 20th Century Crush. Over the years, I have amassed a large collection of 20th Century vintage ephemera. 20th Century Crush will showcase historical gems from this collection. Topics will include food (diet and dining), fashion, popular culture and society, covering the period 1900-1990s. Posts on 20th Century Crush will be shorter in length and can be read in the time it takes to drink your morning tea/coffee/protein shake. I have also carried out a major rebrand across all of my digital and social media platforms. In particular my Twitter handle has changed to @20thCentCrush and I have created a new hashtag, #20thCCrush. This hashtag will feature lots of fascinating, 20th Century inspired content. There will also be a new Instagram account so keep your eyes peeled on Twitter for further announcements. Come Step Back In Time will always have a very special place in my heart. It has brought me great creative joy as well as new friendships and many media opportunities, with television/radio appearances on BBC, ITV and Channel 4. War Room Pass Southwick House. D-Day. Bournemouth Pier, 2011. ©Come Step Back In Time. Hythe Pier, Hampshire, November, 2013. Opened on the 1st January, 1881. The tramway opened in 1909. After the First World War, a second-hand locomotive was purchased from the Avon Mustard Gas Factory and brought into use on the pier in 1922. It still operates today. The pier is one of the longest in Britain. ©Come Step Back In Time. Hastings pier, November 2013. ©Come Step Back In Time. Replica bathing machine used by King George III when he visited the seaside town of Weymouth. He spent 14 summers between 1789 and 1805 there. ©Come Step Back in Time. Brighton’s Palace pier, November 2013. Opened on the 20th May, 1889. Royal Marines Museum ©Come Step Back In Time. Hannah Snell, Royal Marines Museum. ‘Per Mare, Per Terram’ – by Sea and Land. Moto of The Royal Marines. Postcard showing the Royal Victoria Military Hospital, Netley. Edward Fox and his wife Joanna David who gave a wonderful tribute to Dickens including reading aloud extracts from some of his novels. © Come Step Back in Time. Oliver Dickens with his great, great, great, grandfather. © Come Step Back in Time. Abel Magwitch and Molly. Film still from Magwitch (2013). Image courtesy of Violafilms. Grandmother favoured a braided hair style with deep ‘waves’ framing the face. The lady standing-up is my great, great, grandmother. Photograph is dated c.1911. ©Come Step Back in Time. To the right and left of image examples of Coalport’s Parian Porcelain. Two icepails c.1850. Parian is a type of unglazed porcelain with a dense texture and a pure white finish, similar to Greek Parian marble. Coalport stop using this technique in the 1860s. ©Ironbridge Gorge Museum Trust. Example of one of the staff costumes made by The Costume Project for Kew Palace. ©Ironbridge Gorge Museum Trust. A Reproduction (1) Corset from the 1890s made by The Costume Project team. Notice the beautiful stitch detail on the corset. ©Ironbridge Gorge Museum Trust. Reproduction 2 of the Mantua Gown 1740s, made by The Costume Project at Ironbridge. ©Come Step Back in Time. Inside McClures General Draper and Outfitters, no. 3 Canal Street, Blists Hill Victorian Town, Shropshire. An original building from Stafford Place, Oakengates, Telford (exterior and shop front only). c.1880. Opened on site on 4th Apri, 2009. ©Ironbridge Gorge Museum Trust. View of the Iron Bridge over the River Severn. ©Ironbridge Gorge Museum Trust. The Pharmacy at Blists Hill Victorian Town, Shropshire. Jane Austen Festival, Bath, 2011. Gilbert White’s study at The Wakes. The desk shown may have been the original desk owned by Gilbert. Glasses and case belonging to Jane Austen’s mother. On display at Lyme Regis Museum. Inside the 1940s sweet shop. Milestones. Shawl, feathers and cap of bronze mesh with gold sequins. C.1928. Dazzle Exhibition. HCC Arts & Museums. Dazzle Exhibition. Gosport Gallery, Gosport, Hampshire. White satin shoe with oval diamante trim. High curved and waisted Louis heel covered in white plastic, painted with a design on an Egyptian theme in red, green and gold and inset with multi coloured diamonte. Printed label Debenham and Freebody. Wigmore St. C.1935. Dazzle Exhibition.C.1988.124. HCC Arts & Museums. Barlaston Hall. The imposing country house that greets the visitor at the start of the long driveway leading-up to The Wedgwood Museum. This is now a private residence and is only ocassionally open to the public for pre-booked visits. The house was built in 1756-8 for lawyer Thomas Mills from Leek. It overlooks the Trent Valley and the octagonal diamond sash windows are a rare surviving trademark of Taylor’s work. The Apotheosis of Homer Vase. Cylindrical pedestal with white reliefs of fruiting vines, medallions, lions’ heads, ribbons and trophies. Solid blue Jasper Relief decoration modelled by John Flaxman. C.1790. This was my favourite photograph from the exhibition, ladies inspecting one of the new, Creda, electric cooker in the 1920s. This photograph is in the St. Barbe Museum collection. Local actor Bruce Clitherow reading from William Retford’s Memoirs of Growing-up in Ashley. From left to right: ‘sir’ John Pheasant; ‘sir’ Michael Moore; ‘sir’ Graham Hart and ‘sir’ David Winney. Jacqui Wood demonstrating prehistoric cooking techqniques at Buckland Ring Iron Age hillfort, Lymington, Hampshire. Some of the pretty seafront architecture in Lyme Regis. Snazzy, vintage rubber bathing hat. Portsmouth City Museum. Marchpane made by Mike and Jasmine Goodman. Mike’s marchpane depicts Lymington’s Coat of Arms, a sailing vessel. The Tudor Parlour, c.1560, at Avebury Manor, Avebury, Wiltshire. The table is laid with Pewtor ware which became increasingly more poppular amongst the well-to-do than wood fashioned table ware. Emblem worn by 1908 British Olympian Clarence Brickwood Kingsbury. Clarence won two gold medals in cycling. The emblem was sewn onto the front of his jersey. 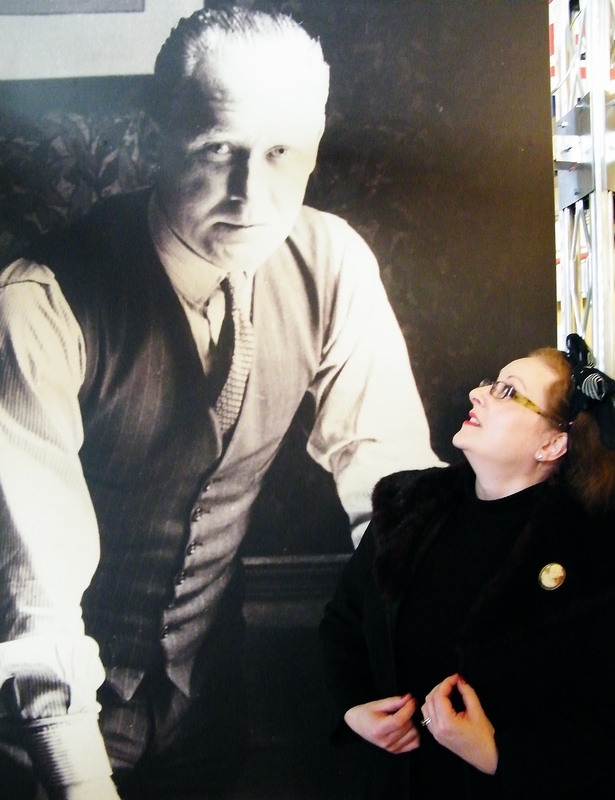 From a recent display about Clarence at Portsmouth City Museum. Loom 10 in the weaving shed showing a Hattersley Dobby loom by William Smith & Bros Ltd of Heywood Lancashire, built in the nineteenth century. An enthusiastic crowd brave the dreadful weather in Mayflower Park. A member of Tudor re-enactment group, The Hungerford Household. Tudor knitting. 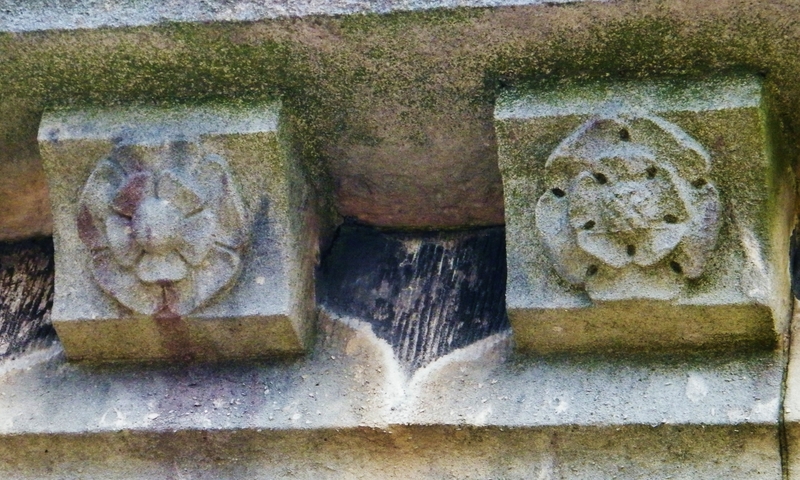 The floating Flemyngs monument, St. Nicolas Church, North Stoneham. Interior of Hurst Castle’s Garrison Theatre. Diamond Jubilee cupcakes that I made for my neighbours to celebrate this momentous event. Well wishes to the Queen from Cunard’s Queen Mary 2. Inside of a 19th century croft house in the Highlands of Scotland. Colbost Folk Museum, Colbost, Isle of Skye. Interior of Bailey’s Maestro Caravan, 1955. Traditional 1950s, British living room setting at Portsmouth City Museum. Not everyone in post-war austerity Britain could afford to have the latest modern design interiors that emerged during this decade. Liz Tilley hat box 1950s. St. Barbe Museum and Art Gallery, Lymington, Hampshire. Family picnic on Galleywood Common. 1957. My grandad’s pride and joy, the Ford Consul can be seen in the background. My grandma wearing her high heels for the ocassion of a picnic always amuses my aunt. Me on the balcony at MShed Museum. To create the look, I took an old Marks and Spencers faux-fur hat, cut-off the brim and fashioned a pillbox style hat. The brim I attached to the neck of an old black, button-through cardigan to create a stylish collar. I removed the buttons of the cardigan and replaced with pearl-look buttons. I borrowed an original pair of white 1950s gloves from my mother-in-law. The stockings I wore were original 1950s, they tended to lose their shape as there was no lycra in them. I wore a 1950s style girdle brought from the London based vintage shapewear specialists What Katie Did. The handbag is an original on loan from my dear friend Carolyn Hair. L-R: Michael Patterson, Claire and Peter Mitchell with their collection of RMS Olympic interior fittings. South Western Hotel. 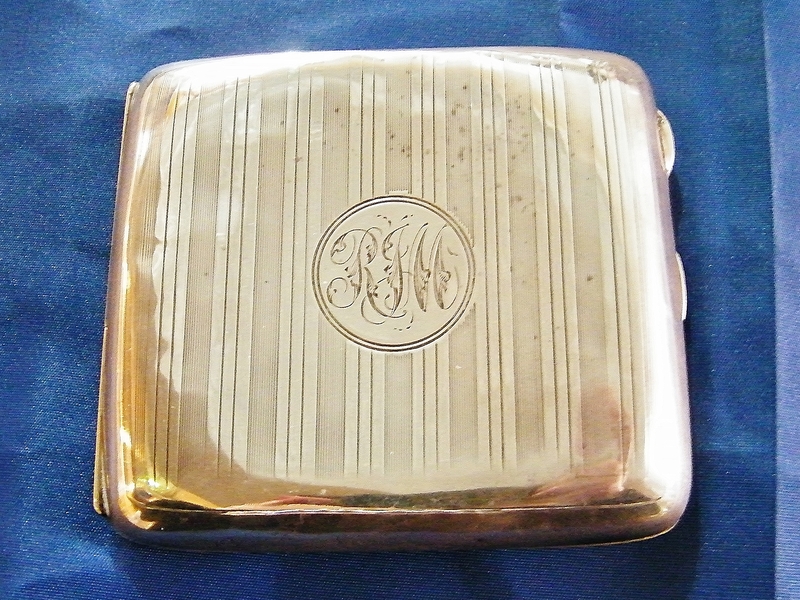 Designed by John Norton in the French Renaissance style. Village Garage, 1930s. Breamore Countryside Museum. Restored 19th Century Shepherd’s Hut in the grounds of Mottisfont Abbey, Romsey, Hampshire. 1890, Doulton’s white Carraraware tiles designed for Oakley & Watling Provisions and Fruit Merchants, 56 High Street, Southampton. The Flagstaff Museum of Tea Ware, Hong Kong Park, Hong Kong. The Southern Skirmish Association, Bath 2011. View of Loch Dunvegan from Colbost Folk Museum, Colbost, Isle of Skye. Tara Howard Proprietress of Langtry Manor Hotel, Bournemouth dressed as Lille Langtry. Image supplied by kind permission of Ms Howard. ‘The Indifferent Sky’ (2011) by Sean Henry. Displayed in the Cathedral Cloisters. Bronze, cor-ten steel, all weather paint. 237cm x 120cm x 149cm. Homage in papier mache to the Duke and Duchess of Cambridge. Bisterne Scarecrow Festival 2011. View of the dining-room at The Red House, from the peephole Albert had installed. A Tudor gentlement enjoying the delights of the restored knot garden. US Medical Company (Union Regiment), Southern Skirmish Association (SOSKAN). Such generous goodie bags provided for us by Penguin Books UK (@PenguinUkBooks). Image copyright – Come Step Back In Time. These beauties were provided by flower subscription service, Bloom & Wild (https://www.bloomandwild.com/ – @bloomandwild). This photograph won me a three month subscription to Bloom & Wild and I gave the prize to my lovely mum. Image copyright – Come Step Back In Time. Since March 2016, I have been the History Editor at Bloggeration (@Bloggeration_) an on-line magazine for bloggers across the globe. Editor in Chief is the fabulous Sarah Moody (@Sairey_bearey ) of The Prosecco Diaries whom I met last year when I attended one of her Blogger workshops in London. You may remember reading my article about this event? Bloggeration has been incredibly successful since its launch a few month’s ago and whether you are new to blogging or a seasoned pro, there is something for everyone in the magazine. New content is posted daily. Bloggeration‘s Twitter account (@Bloggeration_) is very active, a great way to meet other bloggers too. Every Sunday between 9.30 and 10.30 am (GMT), a different Editor hosts #BloggerationChat – a themed Q&A covering a wide range of blogging topics. #BloggerationChat has even trended on Twitter! I will be hosting a history-themed #BloggerationChat on Sunday 8th May and Sunday 22nd May, so do drop by and connect, it will be lovely to meet you there. Quality not quantity. History bloggers tend not to post daily. Articles take a lot longer to research, write-up and curate illustrations. If you are averaging two or three a month then I salute you! Be a proof-reading Ninja. Your readers will quickly lose confidence in you if articles are full of spelling and grammatical errors or broken web links. For my comprehensive feature article on how to start a history blog, click here. Good luck if you start a history blog. Leave me a comment below or Tweet me (@emmahistorian) if you do, I would love to hear about how you are getting-on and am happy to answer any blogging related questions. Basque children arrive at Southampton aboard the liner, SS Habana, having been rescued from the horrors of the Spanish Civil War. May 25th, 1937. I am extremely pleased to finally be publishing this article which I have been researching, on and off, for about a year now. Since the plight of migrant children continues to dominate European news headlines, it felt like the perfect time to crack-on and write-up my notes. Regardless of your political views about refugees, economic migrants or asylum seekers, this is a heart-warming, true story, fundamentally about humanitarianism. The successful evacuation of 3,840 children to Britain from the war-torn Basque region of Spain in May, 1937 is an event in our nation’s history that we should justly be proud of. As the narrator states in the British Pathé film below: ‘Britain has always been a safe haven for exiles’. Perhaps we should all bear this phrase in mind when formulating an opinion about the plight of families fleeing war-torn countries. British Pathe film from 1937, ‘Tragedy of Civil War – Basque Refugee children arrive in England’. Film shows the children arriving in Southampton as well as the temporary reception camp at Stoneham Farm, Eastleigh, near to the city centre. Uploaded to You Tube 13.4.2014. In 1937, Spain was engaged in Civil War and had been since 17th July, 1936. The political background to the War is complex but I recommend listening to Melvyn Bragg’s BBC Radio 4 documentary on the topic from the In Our Time series, broadcast in April 2003, which clearly sets-out the facts. At first, the British government did not want the Basque refugee children to come, intervention could be seen as an act of taking sides. The government wanted to maintain a neutral reaction to this conflict. The Archbishop of Canterbury at the time, William Cosmo Gordon Lang (1864-1945), also found himself in a difficult situation, he too had to adopt the Church of England’s neutral position whilst supporting humanitarian initiatives for the Spanish women and children. Bombing Of Guernica In Spain, April, 1937. The event inspired Pablo Picasso’s 1937 painting, ‘Guernica’. On 26th April, 1937, the non-militarised Basque town of Guernica was heavily bombed. This was one of the first aerial bombings by Nazi Germany’s Luftwaffe. The town was devastated and over 1,600 people killed. Archbishop Lang happened to be in the Basque region at the time, reporting back on the children’s harrowing plight. Public conscience was stirred and the British government were forced to back down. ‘Guernica’, a mural oil-painting on canvas by Spanish artist Pablo Picasso (1881-1973), completed in June 1937, as a reaction to Nazi Germany’s bombing of the town. The painting is housed in Madrid’s Museo Reina Sofia. Originally, the Home Office only gave permission for 2,000 children to be evacuated to Britain. However, since France had already given shelter to between 16,000 and 18,000 refugees, supporters argued that it was not unreasonable for Britain to ‘do her bit’ and take-in 4,000 children. If England will not have them all, 2,000 will be landed at Bordeaux en route, and the rest will be brought to Southampton arriving Saturday. [22nd May, 1937). The people of Southampton rose to the challenge as one might expect from a Port town with a long history of welcoming migrants fleeing persecution. The town needed to pool all of its human resources to pull-off a successful reception and create a suitable base camp for the children. The children only needed accommodation in Southampton for a couple of months, as the plan was to send them on to new foster homes and country houses throughout Britain until hostilities in Spain had ceased. Volunteer helpers cleaning a house in preparation for the arrival of Spanish refugees, 1937. Although the British Government now supported an evacuation, they made it perfectly clear that once on British soil, they would not be held responsible for the children’s welfare. Of course, such declarations just served to fuel the cause. Southampton’s citizens rallied and several days before the refugees were due to arrive, 1,000 of them gathered at the town’s Guildhall to pledge their help, support and donate money. I found the following quotes from regional newspapers in a clippings folder at the Local Studies Centre of Southampton Central Library. They detail how local people rose to this challenge. Organisations, such as the Scouts, Guides, Boys Brigade, YMCA, Salvation Army and Quakers lent their support. Southampton’s school children collected eggs and the town’s local co-op donated food and clothes. An egg-storing depot was set-up at Messrs A. E. Turner’s store, London Road, Southampton. High-profile supporters of the evacuation were The Duchess of Atholl, the Cadbury and Rowntree families and King George VI. Southampton’s response in personal service and in gifts has been magnificent, but there are still several urgent needs unfilled. One of these is a caravan or hut for the use of V.A.D. nurses and as a medical examination room. Gifts of vegetables toys, clothes, etc, are, of course, warmly welcomed, and there is a caravan just outside [of the Stoneham transit camp, near Southampton] for the receipt of gifts. The generous spirit of local folk is above praise; hundreds have been working all hours of the night, and even if they go out of their way to engage a cook or collect a string of cars which turn out to be unwanted, they take it all most philosophically. The spirit of the camp is admirable: one recognised many of Southampton’s leading spirits at work on humble jobs or helping in the shepherding of children: so long as they are useful they do not mind. Even trained nurses were cheerfully filling palliases with straw on Sunday, because that was the most urgent task. Incidentally, someone had the bright idea of turning Sunday afternoon’s curiosity to account, and went round with a tin bowl. He collected £5 in pennies. Three young orphans from Bilbao arrive at Southampton aboard the liner Habana. May 23rd, 1937. On Thursday 20th May, 1937, the SS Habana sailed from Bilbao, France with approximately 3,840 children on board accompanied by 80 teachers, 120 helpers, 15 Catholic priests and 2 doctors. The ship was only meant to carry 800 and conditions on-board were very cramped. It was a tough voyage, many suffered sea-sickness, diarrhoea, particularly around the Bay of Biscay. SS Habana arrived in British waters on Saturday 22nd May, lying-off of Fawley, where it awaited English health authorities to clear its passengers so that it could dock at Southampton Port. Early on Sunday 23rd May, SS Habana finally left her anchorage and docked at Berth 106, arriving just before 8am. The children were given medical examinations then immigration officers took details of their names and parentage, fixing labels to their wrists before they were allowed to troop down the Habana’s gangway onto the safety of Southampton Docks. The children were helped by white-uniformed, Spanish, Red Cross nurses. Once the children had disembarked onto Southampton Quay, they boarded a long line of Hants and Dorset Motor Services buses which the company had loaned for such purposes. Next stop was Southampton Corporation Baths on Western Esplanade, where a host of volunteers bathed them in disinfectant and gave each child a fresh set of clothes. The above immigration procedures may seem a little draconian by modern standards but you have to remember that the living conditions these refugees had left behind were so grim, many of them had become malnourished and vulnerable to disease. All sensible precautions had to be taken to ensure no communicable diseases were inadvertently brought into Britain and worse still, spread throughout the transit camp at Stoneham Farm. In one of the local newspaper reports, I found an account of life in the war torn Basque region, given by a 15 year old girl from the town of Azkoitia in the province of Gipuzkoa. Nine months ago, I was living with my father and two brothers in Azkoitia, where my father was a magistrate. Now my father is in Bilbao, one of 300,000 refugees from the war zone. My brothers are fighting in the Basque Army against the Fascists. When the fighting began all around my home we had to evacuate the village. My father and I went to Guernica. We lived there for eight months – mostly underground – until in one air raid the whole town was wiped out. What had a short time before been a pretty market town was reduced to a mass of flame and ruin. Incendiary bombs fell side by side with high explosives. Panic and bloodshed were rife. All the people in the houses next to that in which I was are now dead. Another account was given by a couple of Roman Catholic priests who had accompanied the refugees to Britain. Benito Juan Sarakoetxea and Padre Gabriel Manterola told reporters at the Southern Daily Echo that the people’s diet had been very poor indeed, food was scarce. Daily rations consisted mainly of fish, black bread and water with some milk made available to children. They also recalled how citizens were so afraid they were living in the safety of their cellars. In fact since 31st March, 1937, the children had been bombed every day except for three days, leaving many of them now in a heightened state of anxiety. Southampton residents were asked not to visit the Docks or line the streets to greet the children. This was not an unfriendly gesture but instead one designed to ensure the children were not over-whelmed. Although, from some of the newspaper reports I have read, local children did cheer and wave as the buses transported the refugees to Stoneham Farm. Stoneham Farm temporary transit camp, May 1937. The temporary reception camp was located at Stoneham Farm, near Eastleigh, just outside of Southampton. A local farmer, G. H. Brown, lent a parcel of farmland to the cause. The site, run by volunteers, was efficiently organised with 400 bell tents and plenty of facilities although it did take a few days for the terrified youngsters to settle. Traumatised Basque refugee child arrives at Stoneham Farm temporary transit camp, May, 1937. In the period leading-up to the refugees arrival, local citizens rallied around to get the Stoneham land ready. Local plumbers laid water pipes, carpenters constructed simple structures and Dockers dug latrines. Depots for food, clothes and toys were set-up all over Hampshire, supported by cricket clubs, churches and women’s organisations. Unsurprisingly, the refugee children were unused to a structured, daily routine. Many of them had, for quite a considerable amount of time, been running wild due to the horrific circumstances back home. There were some instances reported that whilst at Stoneham Farm camp, some children had been caught stealing from local orchards. Another incident detailed several boys having stolen communion wine from the temporary on-site church tent! Refugees lining-up to receive their meal at Stoneham Farm transit camp, Eastleigh. May, 1937. The children were well-fed at the camp, diet consisted mainly of scalded milk, bread, boiled meat and potatoes with peas and onions. Each child was given a daily amount of milk equivalent to 1 and 1/2 pints. There was also plenty of fruit and sweets (thanks to Rowntrees). Cadbury’s also sent down 12,000 chocolate, 12,000 bars. Meals were cooked by local people under supervision of a team of ex-army and navy cooks. There were many daily activities to keep the children occupied including boxing (organised by ex-heavyweight champion, Joe Beckett), a cinema and Spanish/English lessons. Entertainment was organised by Spanish-speaking actor Neville Towne. The artist, Augustus John (1878-1961), visited the camp everyday and sketched the children. A tannoy system was also installed, to keep everyone updated with news from Spain. This was not always very well-received and on occasion very distressful. Boxing practice at the Stoneham Camp. Professional boxer, Joe Beckett (1892-1965) looks on. May 29th, 1937. Over the following months children were gradually sent to foster families and designated centres, which were also known as ‘Basque Colonies’. There were 94 Colonies set-up across Britain. The children were dispersed to country houses and private homes in: Manchester, Swindon, Scarborough, Cambridge, Brampton, Worthing, Tunbridge Wells, Worthing, Ipswich, Derby, Welwyn Garden City, Birkenhead, Watford, Thame, Watford, Richmond, Birmingham, Newbury and of course Southampton. The refugees stayed in Britain for 2 years and when the war ended on 1st April, 1939, all, apart from 500 children were returned to Spain. Many children could not be returned as their families either no longer had a home or had been killed. Approximately 400 children settled permanently in Britain. The father of former Conservative MP-turned broadcaster, Michael Portillo, was a Basque refugee. I was 14 at the time. I cried a lot in the boat on the way over. It wasn’t just me – many children were crying. It was because we knew what was going on with the war, especially in Bilbao. When we arrived in Southampton we were taken to be checked by a doctor, then we went to the campsite at Stoneham. There were so many children to sort out. Our group were sent to Caerleon in South Wales, between Cardiff and Newport. We had a lovely time there, we were very happy in Caerleon because we were one big family. There were 67 of us, and one Spanish lady who looked after us all – we called her our mother. We stayed there for 2 years until the Second World War started and the soldiers needed the rooms. Basque children being given toys in Watermillock, Bolton. 26th June, 1937. Film by British Pathé, ‘Vivid Demonstration’ (1936), shot at Eastleigh Aerodrome (later Southampton Airport) on 26th March, 1936. Film features Vickers Long Range Bomber and a Spitfire prototype. This was the Spitfire’s 2nd test flight. Film also shows pilot Jeffrey Quill getting into the Spitfire. Uploaded to You Tube 13.4.14. Saturday 5th March will be the 80th anniversary of Spitfire’s first test flight from Eastleigh Aerodrome (later Southampton Airport), Hampshire which took place on 5th March, 1936. The first Spitfire test flight lasted 8 minutes. Southampton Airport will be marking this momentous occasion, a Spitfire will take-off from there on Saturday on an 80th birthday flight. It will first fly close to the resting place of its Chief Designer R. J. Mitchell (1895-1937). Continuing along the river Itchen to Southampton Water where it will pass near to the site of the old Supermarine factory in Woolston where many thousands of the aircraft were built. Onwards to Portsmouth harbour before flying back on itself to Southampton Airport. According to Southampton Airport’s website, the Spitfire should be visible, around the Solent, between 11 am and 12 noon on Saturday 5th. Subject to weather conditions, there will be good vantage points along the River Itchen, Weston Shore, Hythe, Royal Victoria Country Park, Lee on Solent and Cowes (Isle of Wight). Afterwards, head down to the brilliant, hidden gem that is Solent Sky Museum, Southampton (Twitter: @SpitfireSolent). On Saturday 5th, this multi-award winning Museum will be open from 12.30pm (admission charges apply) for a packed afternoon of activities to commemorate the Spitfire’s 80th anniversary. A new exhibition will also open on Saturday, ‘Southampton and the People’s Spitfire’, containing over 100 photographs documenting Southampton’s Blitz. This exhibition will focus on Southampton’s role producing the Spitfire in ‘Southampton’s Blitz’. During the Battle of Britain, in 1940, Southampton was heavily bombed and the Supermarine factory was destroyed. Spitfire production was dispersed to any local site with enough floor space to produce Spitfire components. The exhibition also commemorates the heroic efforts of local residents to maintain Spitfire production at all costs. The Spitfire production line at the Vickers Supermarine Works in Southampton, 1940. There were 20, 531 Spitfires built, the last one rolled off the production line in 1947. 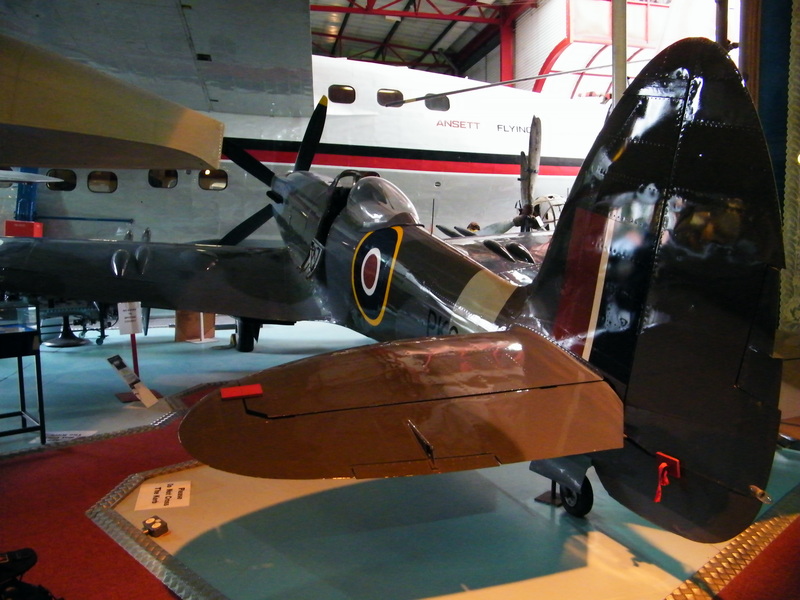 Surviving examples are extremely rare (there is one in Solent Sky Museum – Mk24 PK683). The first Spitfire prototype was originally called “The Fighter” F.37/34 but subsequently this changed to prototype K5054. Captain Joseph “Mutt” Summers (1904-1954) piloted the first Spitfire test flight in 1936. Mutt joined Vickers Aviation Ltd in June 1929, a year later he became chief test pilot at Supermarine Aviation Works. Jeffrey Kindersley Quill (1913-1996), piloted the second test flight on 26th March, 1936 (see film at top of article). Jeffrey was known as “Mr Spitfire” and was Mutt’s assistant. In January, 1936, he began working at Vickers and its subsidiary Supermarine. ‘Solent Sky Museum Seeking Stories Recalling World War Two’ by Shan Robins (That’s Solent TV) featuring an interview with Museum Director Sqn/Ldr Alan Jones MBE CRAeS RAF Rtd. Alan also introduces some special Spitfire related artefacts from the Museum’s deep archives. Uploaded to You Tube 13.2.2016. I recently assisted on and participated in several films made by Shan Robins (Senior Broadcaster at That’s Solent TV) shot on location at Solent Sky Museum. It was a wonderful opportunity to find-out more about some of the Museum’s most famous exhibits. ‘The Schneider Trophy’s Influence on the Design of the Spitfire’ film by Shan Robins (That’s Solent TV) featuring Museum Director Sqn/Ldr Alan Jones MBE CRAeS RAF Rtd. Uploaded to You Tube 4.2.2016. ‘Flying Boats: A Look Back at a Bygone Era’ by Shan Robins (That’s Solent TV) featuring an interview with myself made on location at Solent Sky Museum, which is also home to the ‘Beachcomber’, a flying boat originally built in 1943 as a Short Sunderland Mk3, but in 1947 was converted to operate commercial flights with passengers. Uploaded to You Tube 18.2.2016. There are many exhibits at Solent Sky that fascinate me but the Beachcomber is by far my favourite. In 2012, I wrote an article about the Beachcomber. On my recent visits to make the above films, I made sure I spent some more time looking around this lovely vintage flying boat. In the summer of 1919 (16th August), Supermarine operated Britain’s first commercial flying boat service from the Royal Pier, near Southampton docks. The first flights were local, to Bournemouth, Portsmouth and Isle of Wight, on a Channel Mk.1 aircraft. In September, 1919, Supermarine operated its first international flying boat service from its premises at Woolston travelling to Le Havre. The service to Le Havre did not operate for long, starting-up again in September 1923 when flying boats serviced the route between Woolston and Cherbourg. In 1924, British Marine became Imperial Airways who continued to operate flying boat services from Woolston. Between the 1924 and 1958, Southampton became one of the busiest flying boat ports in the world. Before the jet age really took hold, towards the end of the 1950s, flying boats were the popular, if most expensive, method of travel overseas. Only the wealthy could afford the ticket price as well as spare the time needed to complete the journey. Travelling to the other side of the world by flying boat could take eight days or more. Some of the journey would have to be made via ship or other modes of transport until flying boats were servicing more routes. Eight days may seem a long time now but actually, back then it was considered extremely quick! Film by British Pathé, ‘Flying Boat – Sydney Aka New Empire Flying Boat Leaves Sydney For Southampton’ (1938). Like the Spitfire, the flying boat is also celebrating a big birthday this year. On 3rd July it will be the 80th anniversary of Imperial Airways’ first Short C Class flight from Southampton which took place in 1936. Imperial Airways’ first revenue flight took place on 6th February, 1937 and henceforward, Hythe (near Southampton), became the airline’s home base. Only 42 of this type of flying boat were built. In the new C Class ‘boats, passenger comfort took precedence. A smoking cabin at the front of the aircraft was fitted out like a lounge, with chairs facing each other around small tables. Behind this was a galley, where a steward delivered restaurant quality meals on china plates. Amidships was the “promenade” deck with large, high-placed windows where passengers could stand and see their sights. In all, 24 passengers could be carried. All this luxury came at a high price, however. The round trip from Southampton to Australia cost as much as a small house in 1937…. Today, aircraft travel at upwards of thirty thousand feet, and frequently all that is visible is clouds. In the C Class, though, there was no pressurised cabin, so flying took place at low level for the whole of the journey. 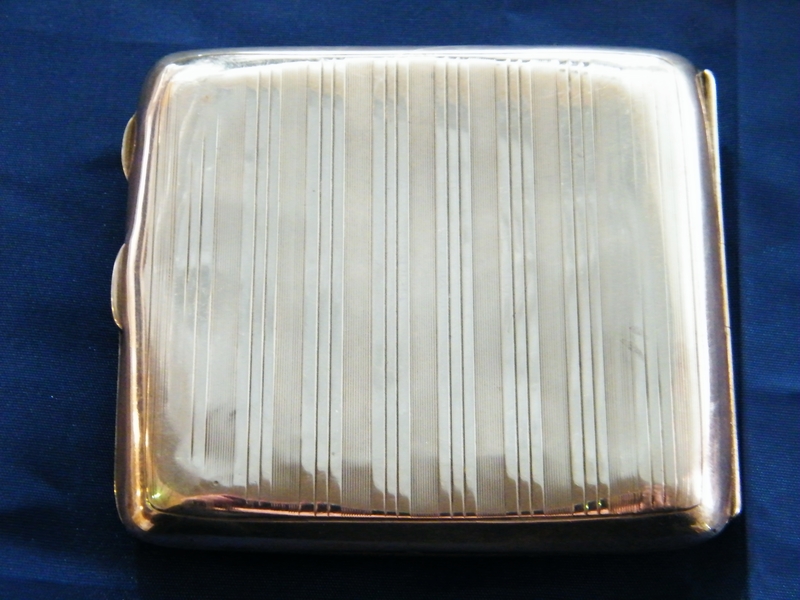 This enabled Imperial Airways to make scheduled flights almost into sight-seeing tours. This first C Class flight took place over Southampton Waters. Southampton was chosen as the location for an international “marine aeroport”, or “airport”. As the name suggests, the first airports were actually located at seaports, Southampton being one of the first. Airports were originally not the landlocked complex of buildings and terminals that we know today. Historically, that type of airport would actually have been known as an aerodrome. In the 1930s, Southampton’s aerodrome was based at Eastleigh and is today Southampton Airport. British Pathé film, ‘Empire Flying Boat (Imperial Airways) ‘Centaurus’ leaves for flight to New Zealand from Southampton’ (1937). Uploaded to You Tube 13.4.2014. Imperial Airways flying boat ‘Centaurus’ at Hythe, Hampshire with its five- man crew. The plane flew to Egypt, Iraq and Singapore bringing India to within 2 and 1/2 days air-travel from Britain. L to r Flt Clerk R Doel, First Officer A Richardson, Captain J Sheppard, Wireless Operator L F Mitchell and steward E W Rowcliffe. 1938. In March 1937, Imperial Airways Limited (1924-1939) started their twice-weekly services to Alexandria and later that year to South and East Africa. These aircraft were maintained at the Hythe flying-boat base until early 1938 when operations moved to Folland’s hangar at Hamble which could now handle five C Class boats at any one time. A snapshot photograph of a an Imperial Airways flying boat moored to a jetty in Southampton harbour, taken by an unknown photographer in about 1935. Imperial Airways established their services as four times a week to India, three times to East Africa and twice to Durban, Malaya, Hong Kong and Australia. On 5th July 1937 their first Transatlantic service was started with flights from the UK by Imperial and from the USA by Pan American. In September 1939, Imperial Airways transferred their aircraft and services to Poole Harbour. Photograph from 1936. A Flight Steward aboard the giant flying-boat, ‘Canopus’ serves breakfast to passengers in their bunks. Imperial Airways’ Canopus was on the Alexandria-Athens service. It cruised at 200mph and carried 16 passengers in night stages. 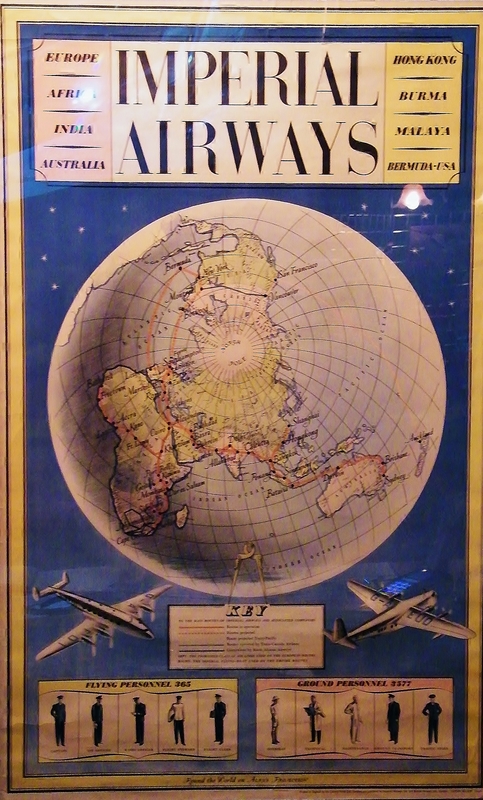 Advertising poster for Imperial Airways (1939). On display at Solent Sky Museum, Southampton. In the pre-war era, flying with Imperial Airways was everything you would expect it to be, if you had money that is. Passengers who flew regularly with the airline were even allowed to have their valet with them. If you didn’t have a valet to look after your every in-flight need, then you would be looked after by a Flight Steward. In these early years of seaplane travel, all Stewards were male. Facilities on-board these early flying boats were not luxurious but were adequate. The Short Calcutta and Kent flying-boats were equipped with twin-burner oil stoves, there were no cooking facilities on the Empire ‘boats. Restaurant standard meals were prepared locally in ports across the world, decanted into vacuum flasks and stowed for service in either hot boxes or ice chests. Steward preparing lunch in the galley of an Imperial Airways, Short L.17 Scylla, a landplane version of the 38 passenger Kent flying boat. The London-Paris route, 1934. Fruit juices were transferred from the vacuum flasks into serving jugs, bread rolls and Ryvitas were placed in baskets. Food was always served on china plates. Preserves and butter were put on plates and covered with doilies. White linen table cloths and serviettes, metal cutlery, side plates and cruets were laid-out on the tables in each of the cabins. Imperial Airways, the Short L.17 Scylla, was a landplane version of the 38 passenger Kent flying boat. Flight Steward attends to his passengers on the London-Paris route, 1934. The Mayoress of Southampton christens the ‘Southampton.’ Naming ceremony of the RMA ‘Southampton’, at which a libation of wine from a silver ewer is poured over the aircraft. The ceremony took place at the new flying boat base at Southampton docks (Berth 50) which allowed passengers to step ashore straight into the airport buildings. Officially opened by Lord Nathanon on 14th April, 1948. After World War Two, Imperial Airways became the British Overseas Airways Corporation (BOAC). The last C Class retired in c.1947. A new marine air terminal was built for BOAC at Berth 50 in Southampton’s docks with bars, lounges and dining rooms, and a direct rail line was established to London Waterloo. However, in 1948, BOAC gradually started to replace their flying boats with modern land aircraft. Their flying-boat services, from Southampton, finally ended in the autumn of 1950. British Pathé film, ‘Flying Boat Deck'(1948). Showcases the new BOAC Marine Terminal in Southampton. Uploaded to You Tube 13.4.2014. Following BOAC’s decision to no longer operate a flying boat service out of Southampton, Aquila Airways, an independent airline, stepped-in and filled that gap, well at least until 1958. Aquila Airways Ltd was formed on the 18th May 1948 by Wing Commander Barry Aikman and operated from Hamble Beach, adjacent to the former Folland slipway. Aquila serviced the popular route between Southampton and Madeira, initially under a BOAC Associate Agreement. Aquila also provided charter flights carrying ships’ crews. In 1948, Madeira could only be reached by ship, there were no direct flights. When Berth 50 at Southampton docks became vacant, Aquila moved in. By 1951, the airline had 12 aircraft. At the beginning of 1949 Aquila purchased the remainder of BOAC’s Hythes and parked them on the beach at Hamble. Aquila was able to make use of Berth 50 at Southampton Docks and G-AGEU Hampshire departed on a proving flight to Funchal Bay on 24th March. Its deluxe cabins with thirty-one seats were served by three stewards, with a cocktail bar available. Shirley was an air hostess for Aquila Airways, Southampton during the 1950s. Ivor was a flight engineer, the couple met during a practice boat-drill in 1953. When they married, they had a marzipan flying boat on top of their wedding cake. Many stars of stage and screen flew with Aquila in the 1950s including: Harry Secombe; Terry Thomas; Trevor Howard; John Huston; Bernard Miles; Peter Butterworth; Janet Brown and John Mills. The golden age of international flying boat travel from Southampton slowly drew to a close. The flying boats could no longer compete, in terms of cost, speed and flying times, with planes like the de Havilland DH 106 Comet, a British jetliner introduced in 1952. Occasional flying boat pleasure flights still took place over the Southampton Water. I was delighted when Ohio-based author, Kerrie Hollihan, contacted me to ask if I would like to review her latest book, In The Fields and the Trenches: The Famous and The Forgotten on The Battlefields of World War One. Published last month by Chicago Review Press, In the Fields and the Trenches is Kerrie’s 6th YA non-fiction work for this excellent publishing house. I have previously reviewed several YA non-fiction books from Chicago Review Press, both by author Kathryn J. Atwood Women Heroes of World War 1 and Code Name Pauline. Kerrie’s new book is a collection of 18 biographies of young men and women who bravely and selflessly decided, to ‘do their bit’ on the frontline in World War One. Several individuals, featured in In The Fields and the Trenches, went on after the war to become well-known in a variety of occupations from writer to president to film star (J. R. R. Tolkien; Ernest Hemingway; Harry Truman and Buster Keaton). Others were from high-profile families such as The Young Roosevelts or Irène Curie, daughter of Marie and Pierre Curie. The Comedian: Buster Keaton (American). *Biographies feature later in this article. Walter Koessler (1891-1966). A German architectural student who was called-up to fight for his country in World War One. Walter served in the German Officer Corps. He brought along his camera to capture many aspects of a soldier’s life on the frontline as well as in the trenches. After the war, he arranged all his photographs in an album ‘Walter Koessler 1914-1918’. This photograph was taken during Walter’s first months as a German Officer. He is pictured here with his motorbike. ©Dean Putney. Although In The Field and the Trenches is aimed at the YA market, I highly recommend it to anyone interested in reading a fresh perspective on World War One. Hidden histories of extraordinary young people many of whose stories may have been forgotten forever if it wasn’t for writers like Kerrie. The book also includes a very helpful World War One Timeline to contextualize some of the events featured in the biographies. I notice Kerrie dedicated this book to her grandfather, the inscription reads: ‘Frederick Urban Logan – US Army soldier and bugler in France 1918-19’. World War One is obviously a period in history that has a particularly strong personal connection to Kerrie. One of Walter Koessler’s photographs. Soldiers washing and doing their laundry in livestock troughs during World War One. ©Dean Putney. Wars are fought by young people, and young people fighting wars make history – in ways great and small…They fought in battles, flew warplanes, killed the enemy, nursed the wounded, and fell in love. One died in combat. The rest came home, their lives forever changed. Some of them had famous names, but most did not. Some had distinguished themselves in battle and returned as war heroes, while others would reach their prime as writers, businesspeople, scientists, and film stars. One became president of the United States. Another died penniless, estranged from his family. These men and women lived a century ago. They felt altogether modern, and indeed, for the time they lived, they were. They encountered heroes, cowards, comics, and villains. They learned about human nature – power, greed, death, love, hate, courage, and fear. Like women and men of any age, they came away from a devastating experience with mixed feelings of despair, joy, hatred, loss, and hope. Their stories plainly show how they shared with us the tough journey that we call life. Photograph of the trenches in Winter by Walter Koessler. ©Dean Putney. I have chosen 2 of my favourite biographies, from In The Field and the Trenches, to share with you here. The Aviatrix – Katherine Stinson and The Showgirl – Elsie Janis. In Spring 1912, she became only the 4th American woman to earn a pilot’s license. Early in her flying career she made good money ($1,000 to $2,000 per week) performing acrobatic flying displays using her fabric-winged biplane. An extremely dangerous way for anyone to earn a living let alone a 5ft 5, young woman weighing only 100lbs! She took great pride and care maintaining her own plane and hired only the best mechanicians (known nowadays as mechanics). The army might have forbidden her to fly in France, but the US government knew that a flying schoolgirl could appeal to Americans’ hearts and open their pocketbooks. Put to work as an airborne publicity stunt, Katherine flew from town to town on a campaign to sell Liberty Bonds to help pay for the war. She also raised $2 million for the American Red Cross, and she ended that fundraising journey by landing on a white cross in front of the Washington Monument. In July, 1918, she piloted the 1st airmail flight in western Canada, from Calgary to Edmonton. However, she still wanted to ‘do her bit’ in France. If she wasn’t allowed to be a pilot, then she would offer her services as an ambulance driver for the Red Cross. She joined the ambulance corps in August, 1918 and was soon sent to France. After the war, she got permission to work as a pilot and fly mail between Paris and General Pershing’s army headquarters. Unfortunately at that time, the Spanish Flu pandemic was sweeping across Europe and North America. She succumbed to the virus and ended-up in a Paris Hospital. As it turned out, during the war she had, unbeknown to her, also contracted tuberculosis and her health was now ailing. She spent years convalescing. Whilst in a sanatorium in Santa Fe, New Mexico, she met Miguel Antonio Otero Jr, who had been a pilot in World War One. They married in 1927. She went on to become an architect. She first set foot on stage when at just 2 and 1/2, dancing in church socials. A child star from the get-go, she could sing, dance and act. Her mother, Janice Bierbower, was a typical stage mum who managed her daughter’s career, travelling everywhere with her. A professional stage career took her all the way from Broadway to Europe and back again. In 1917, aged 28, she was in London with her mother, their maid and her Pekingese, Mousme. Despite not having permission from the US government to visit Europe, she decided to make the journey anyway. Afterall, she was a big star and surely no-one would refuse her entry? Elsie was a trooper and performed up to nine shows in one day. She entertained on makeshift stages and tabletops, and she felt just as comfortable taking her show into hospital wards. She always opened her act with that same question, “Are we downhearted?” Bold, brash, and talented, she sang, danced, did a few imitations, and cracked jokes for the troops. Not everything went well whilst they were in France. She refused to wear a uniform and one occasion in Provins, on her way to entertain 2,000 US troops at Chaumont, both her and her mother were arrested on suspicion of spying. This incident could have been avoided had she worn military attire. French officials examined the pair’s paperwork and after much fuss, eventually allowed them both to proceed. Being in France must have been heart-breaking for her. In 1916, her British boyfriend, actor and singer, Basil Hallam Radford (b.1889) had been killed during the Battle of the Somme. He was a member of the Royal Flying Corps. After World War One, she continued her career on stage and the silver screen, Women in War (1940) was her last film. When her mother died she married Gilbert Wilson, moving to Hollywood in 1936. For her contribution to the motion picture industry, she has a star on the Hollywood Walk of Fame. 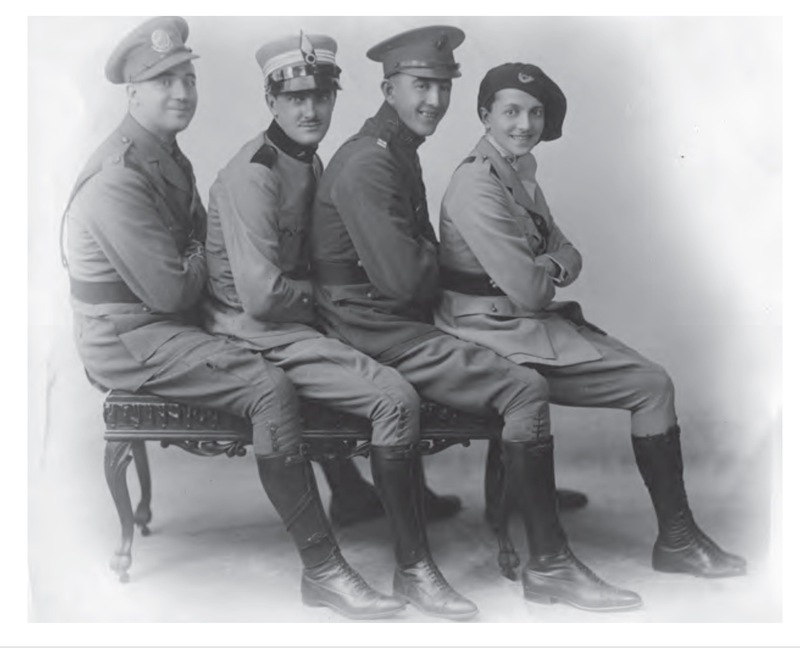 Elsie Janis and ‘her boys’, dressed as World War One veterans from the US, Britain and France. In 1920, Elsie reprised her wartime experiences in a show. Image courtesy of Kerrie Hollihan. Author’s own collection. Short film I made with That’s Solent TV. The SS Stella Memorial, Southampton. Film by Shan Robins (Twitter: @ShanTwoots ). Uploaded to You Tube 5.2.2016. 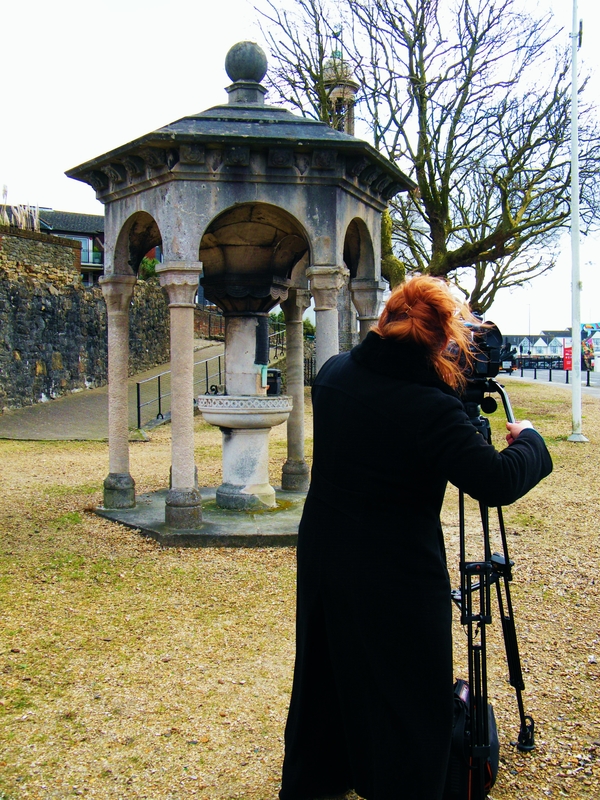 A few weeks ago, I made a short film with That’s Solent TV ‘s senior broadcaster, Shan Robins (see above). Shan and I made our film on a day with practically hurricane force winds! The microphone struggled a little bit, but nonetheless, hope you enjoy. 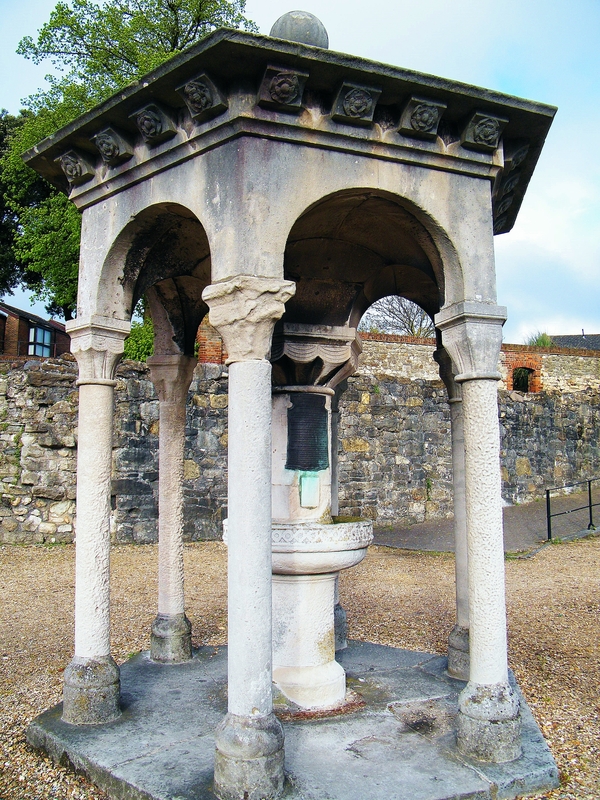 The Stella Memorial (previously known as The Rogers Memorial and before that The Stella Stewardess Memorial Fountain) is located on the Western Esplanade in Southampton. The monument has intrigued me for a long time, having passed it numerous times on foot whilst en-route to the city’s heritage quarter. 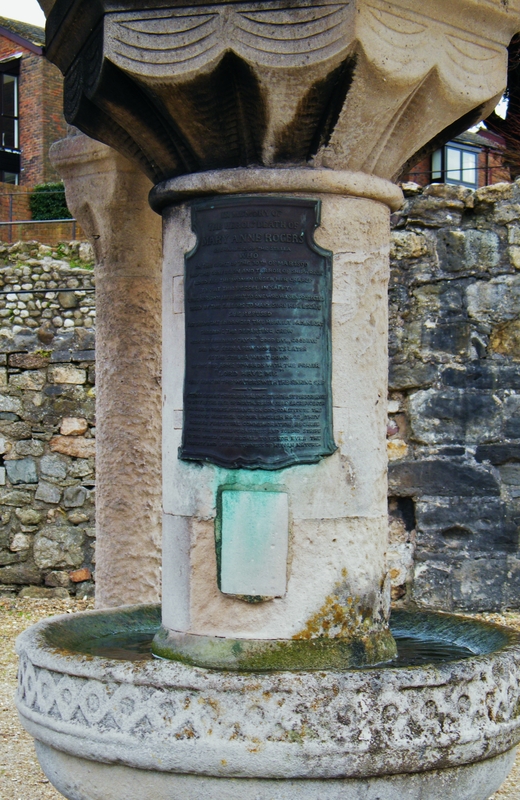 The memorial is dedicated to Southampton stewardess, Mary Anne Rogers (nee Foxwell) (1855-1899), who lived in Southampton and drowned when the SS Stella sank in March 1899. Mary’s backstory is heart-breaking. Born in Frome, Somerset on 14th February, 1855. She had 6 siblings, 2 of which were born after the family moved to 19 Weston Shore Road, Southampton shortly before 1865. In 1871, aged 17, Mary moved out of home and went to work as a general servant for Charles Trubbett and his family. Mary didn’t go far, the Trubbett family lived next door at 17 Weston Shore Road. On 20th March, 1876, Mary married Richard Rogers (c.1852-1880) at the Independent chapel, Northam, Southampton. The couple had 2 children, Mary Ellen (b.1878) and Frederick Richard (b.1881). The Rogers’ marital home was located in Chantry Road, Southampton. Richard, a seaman, worked for London and South Western Railway (LSWR). On 21st October, 1880, 4 years into their marriage, Mary 6 months pregnant with their 2nd child, Richard drowned at sea. He was swept overboard on the SS Honfleur whilst working as a second mate. His death was in an era long before the Health and Safety Executive, ambulance chasing lawyers and large compensation claims being brought by family members against negligent employers. Instead, in 1899, it was normal practice for railway companies to offer employment to the immediate family of deceased employees. A job would be offered to either the surviving spouse or eldest child in the family. The latter in this instance was, of course, not an option. This precedent negated the company’s responsibility to have to pay either compensation or provide a livable pension to the family. In other words, pay money out with no return for an indefinite period of time. There was considerable pressure to accept employment. With a toddler already and another baby on the way, Mary had no option but to accept a job with LSWR. Almost immediately after the birth of her son in January 1881, Mary began work as a stewardess for LSWR. Her earnings were 15 shillings a week plus any tips received from passengers. For a woman in her circumstances, this was a decent, stable income and in modern terms, a job with prospects. It also kept her family out of the workhouse. Mary’s parents, James (d.1899) and Sophia (d. 1894) Foxwell, looked after their 2 grandchildren in their home at 22 Albert Street, Southampton while Mary spent long periods of time away at sea. The family eventually moved into 45 Clovelly Road, Southampton and named their home Frome Cottage, a nod to their Somerset roots. …. was in essence that of a lady’s maid or nursery nurse and many of the duties were essentially domestic in nature, such as attending to the needs of ladies in their bedrooms or in the female lounge, and washing and tending to the children. Now, though, as the Stella pitched and rolled, throwing its passengers around like skittles, the stewardesses were wholly responsible for the lives of the women and children, rather than simply for their domestic requirements. The SS Stella was one of 3 sister ships built for LSWR at a cost of £62,000 (nearly £4 million in today’s money). Completed in October 1890, she had a top speed of 19 knots and was licensed to carry 712 passengers. Fitted-out with all mod-cons, electric lighting and 1st class cabins had en-suite toilets. There was even a Ladies’ Saloon and a Smoking Room for gentlemen. The Stella serviced the popular Southampton to Guernsey and Jersey route. In fact, it is likely that the two women walked together to the quay in Southampton on the morning of 30 March 1899; the same quay where, the following day, relatives of those on board the Stella gathered anxiously to wait for news of their loved ones. Ada’s father had worked for London South-Western Railway but an accident had recently left him paralysed so, like Mary, she went to work for LSWR in order to support her family. Incidentally, SS Stella’s captain, William Reeks, also lived in the next road to Mary, Oxford Avenue. The Stella was fitted with 2 lifeboats, 2 cutters, a dinghy and 2 Berthon collapsible boats. There were life jackets for 754 people and 36 life buoys. However, the lifeboats could only carry 148 passengers. There was not enough time to lower the 2 Berthon boats. Five lifeboats were launched at rapid speed. One boat drifted until the Vera found it at 7am on Good Friday. Another boat drifted for 23 hours and was rescued off Cherbourg. The port side lifeboat capsized after launching, stranding its passengers. It drifted for several hours then was righted by a high wave. The survivors managed to pull themselves in. Unfortunately, they could not find the boat’s bung and the vessel filled, almost to its top, with seawater. The airtanks were the only reason the lifeboat managed to remain afloat. Survivors had to continually bail out the waist-height water with their hats and shoes. Four people died in this lifeboat, including its only woman survivor. The others were rescued by a French tug, Marsouin, at 3pm on Good Friday. One of the Marsouin’s crew straightaway located the bung on a chain! Unfortunately, detailed passenger lists are not available, these went down with the Stella. Many of the bodies were never recovered, including that of Mary and Ada. Captain Reeks also went down with his ship. Out of the 217 passengers and crew on board the SS Stella that day, 112 survived and 105 drowned. A total of 86 passengers and 19 crew members perished. Queen Victoria (1819-1901) sent a message of sympathy to the bereaved families via the LSWR offices. Witnesses observed that the sea surrounding the wreck was littered with life belts, timber, luggage, personal effects and a furniture van. Some of the bodies were located in unusual places because of tidal flows. One was found in the mouth of the River Seine and the final corpse washed-up on a Guernsey beach 9 months after the sinking. Many of the corpses were found floating still in their life belts leading to the conclusion that death had been caused by exposure rather than drowning. The Board of Trade enquiry began on 27th April, 1899 at the Guildhall, Westminster. Its conclusion, ‘the SS Stella was not navigated with proper and seamanlike care.’ The wreck of Stella was discovered in June, 1973, by two Channel Islands divers. It lies in 49 metres (161 ft) of water south of the Casquets. The tragedy is sometimes referred to as ‘The Titanic of The Channel Islands’. Many tragic stories emerged following the sinking of the SS Stella. One of the saddest is the fate of the Glover children. Seaman Thomas Glover drowned in the tragedy, he left behind a 2nd wife and 5 children from his previous marriage. Thomas Glover’s 1st wife, Rosina Bella Glover, (nee Rickman) was born in Southampton, 1866. In July 1897, Rosina was run down by a Misselbrooke & Weston horse and cart in Shirley High Street, Southampton. Misselbrooke and Weston were an established local, family-run grocery business which had opened in 1848. The business was eventually sold to Tesco. Elsie Lilian Glover (b.1896). Fate unknown following her admission to the Workhouse. 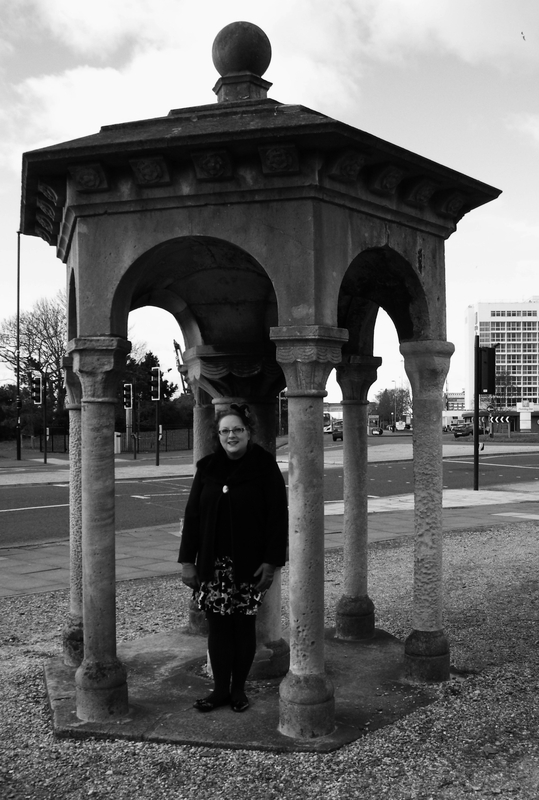 The memorial was unveiled on Southampton’s Western Esplanade by Lady Emma Crichton (daughter of the Lord Lieutenant of Hampshire) during the morning of Saturday 27th July, 1901. Present also at the unveiling were Mary’s sister, son and son-in-law. Artist Herbert Bryan’s original suite of designs, submitted to Southampton Borough Council and Estates Committee, included a drawing of a memorial seat. The Committee rejected the proposed seat in favour of a more appropriate and practical drinking fountain. However, the memorial has long since ceased to function as a drinking fountain and 3 bronze masks (grotesques) from whose mouths water flowed have now been removed. (Source: Southampton Memorials of Care For Man and Beast by A.G. K. Leonard, published by Bitterne Local History Society: Southampton, p.46). The memorial was paid for by public subscription. The sum of £570 15 shillings 8d (approximately £35,000 in today’s money) was raised from 519 subscribers. Amongst the subscribers were Emily Davies (1830-1921) and Dr Elizabeth Garrett Anderson (1836-1917). Emily was a prominent feminist, educational reformer and suffragist born in Carlton Crescent, Southampton. Elizabeth was an English physician and feminist, the 1st Englishwoman to qualify as a physician and surgeon in Britain. After the memorial costs had been covered, £50 was paid to Mary’s daughter as a wedding gift. Her son received £200 to be paid at intervals until his shipwright apprenticeship finished. A sum was also allocated to pay for Mary’s father’s funeral costs, he had died shortly after the Stella disaster. Herbert William Bryans (1856-1925), Annie’s husband and well-respected stained glass artist. Herbert designed the memorial with input from his wife, Frances Cobbe and artist G.F. Watts. Irish philanthropist and religious writer Frances Power Cobbe. 1860. 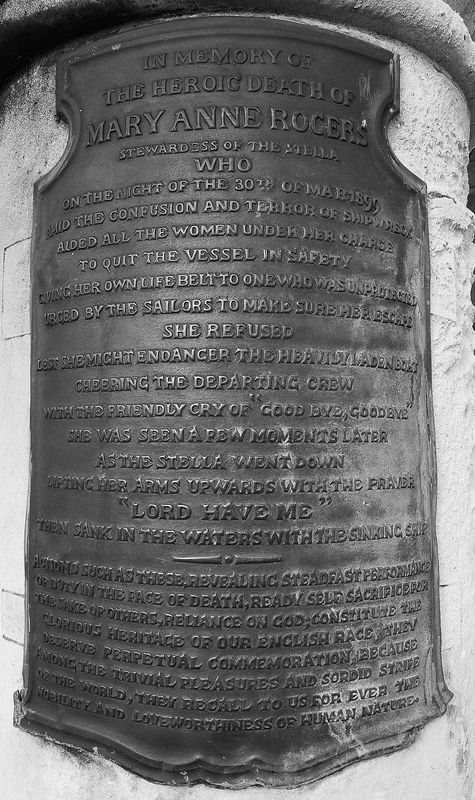 In memory of the heroic death of Mary Ann [e] Rogers Stewardess of the “Stella” who on the night of the 30th March, 1899, amid the terror of shipwreck aided all the women under her charge to quit the vessel in safety giving up her own life-belt to one who was unprotected. Urged by the sailors to makes sure her escape she refused lest she might endanger the heavily-laden boat. Cheering the departing crew with the friendly cry of “Good-bye, good-bye.” She was seen a few moments later as the “Stella” went down lifting her arms upwards with the prayer “Lord have me” then sank in the waters with the sinking ship. Actions such as these – revealing steadfast performance of duty in the face of death, ready self-sacrifice for the sake of others, reliance on God – constitute the glorious heritage of our English race. They deserve perpetual commemoration, because among the trivial pleasures and sordid strike of the world, they recall to us forever the nobility and love-worthiness of human nature. Platinum print photograph (1892) by Frederick Hollyer (1837-1933) of British artist George Frederic Watts. Known as ‘England’s Michelangelo’, Watts was one of the most important painters of the late Victorian period. George Frederic Watts RA (1817-1904) advised Annie, Herbert, Frances and their group on the design of the memorial. Local newspapers reported that the designer, Herbert: ‘acted under the advice of Miss Cobbe and G. F. Watts, R.A.’ but it is uncertain how much the latter, then nearing the end of his distinguished artistic career, contributed to the actual design of the memorial.’ (Source: Southampton Memorials of Care For Man and Beast by A.G. K. Leonard, published by Bitterne Local History Society: Southampton, p.46). 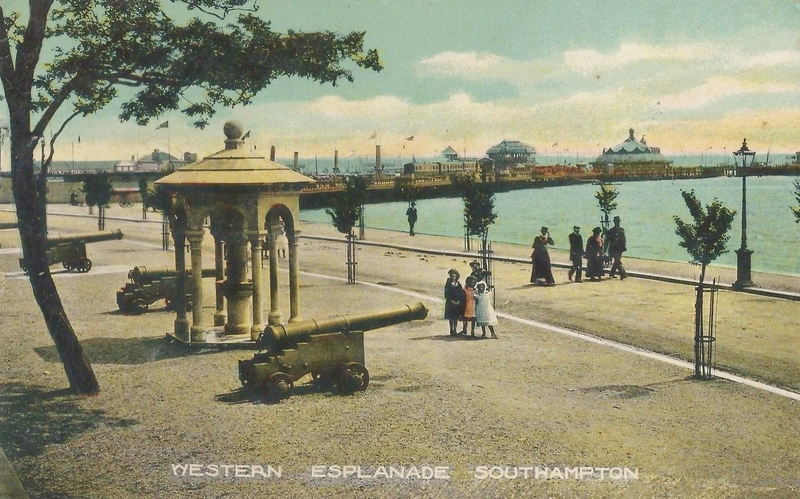 Postcard, issued in 1903, showing the memorial on Western Esplanade, Southampton. There were many postcards of local views and landmarks of Southampton in circulation at this time. This postcard was a particularly popular image which was photographed by Whitfield Cosser of Hanover Buildings, Southampton. The cannons shown here, British nine-pounders, were spoils of war from the Crimean campaign (1853-56) and were smelted down during World War Two. I met author and academic, John Broom, in 2014, when our paths crossed in the history blogosphere. John had just launched Faith In Wartime and we exchanged ideas on getting started with blogging. He is now an established history blogger. Faith In Wartime has gone from strength-to-strength with a fast-growing readership. John graduated in History from the University of Sheffield in 1991 and has pursued a career in teaching, firstly in History, and latterly as a Specialist Teacher in Autism. In 2006, the inheritance of a collection of papers and memorabilia, written between 1940 and 1946 by his late father who served in the Desert Rats, sparked in John, a passion to discover the links between twentieth-century warfare and religion. After completing an MA in Local and Regional History with the Open University, John decided to study for a PhD at the University of Durham. He has also conducted research on behalf of the Bible Society for their First World War website. John’s PhD research explores connections between the Second World War and Christian culture in Britain. He plans to complete his PhD in 2017. In 2015, Pen & Sword Military published John’s first book, Fight the Good Fight: Voices of Faith from the First World War (ISBN: 9781473854154 – Price: £19.99 / $39.95). When John approached me to ask whether I would like a copy to review, of course I was delighted to accept. Fight the Good Fight is a fascinating read and very well-written indeed. The book is a detailed study of a usually hidden aspect of wartime social history, the topic of Christian faith. Fight the Good Fight has been meticulously researched and includes a wealth of previously unpublished material. I am pleased to commend this book of case studies of Christians from all walk of life, of many different denominations and displaying a wide spectrum of political views. It includes accounts from the Western Front, the home front and from the prisons of Britain that held conscientious objectors and those on the Continent that held prisoners of war and spies. These stories help us to understand better an aspect of the rationale behind the response of so many to the challenge of global warfare, and further increase our admiration for the depth of belief and of personal character that so many were called to show. Fight the Good Fight demonstrates the variety of ways in which people of different denominations; Anglican, Catholic and Nonconformists, interpreted the war as combatants, civilians, chaplains and conscientious objectors. The book will interest anyone who is fascinated by the social history of World War One, regardless of their religious persuasion. Whilst a toxic mixture of nationalism and militarism tore Europe and the wider world apart from 1914 to 1919, there was one factor that united millions of people across all nations: that of a Christian faith. People interpreted this faith in many different ways. Soldiers marched off to war with ringing endorsements from bishops that they were fighting a Godly crusade, others preached in churches and tribunals hearing that war was fundamentally against the teachings of Christ. 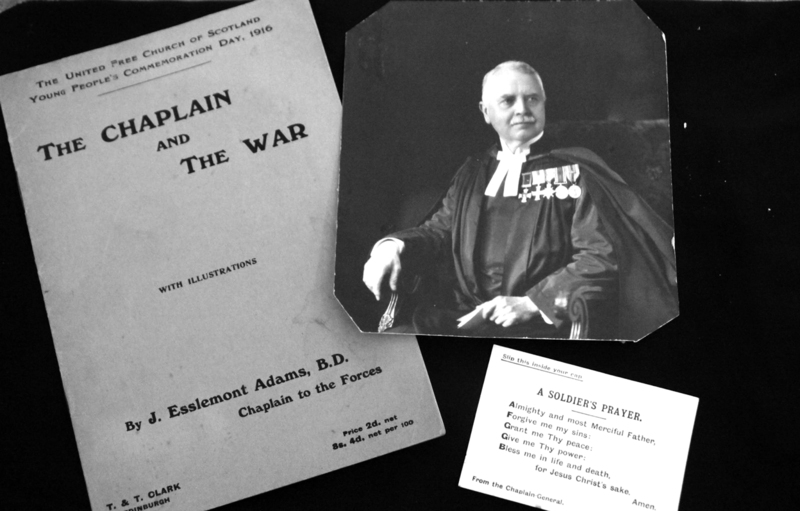 John Esslemont Adams (1965-1935) was an Army Chaplain who served on the Western Front in World War One. Image courtesy of University of Leeds Special Collections. Whether, Church of England or Nonconformist, Catholic or Presbyterian, German Lutheran or the American Church of Christ in Christian Union, men and women across the globe conceptualised their war through the prism of their belief in a Christian God. Fight The Good Fight brings together individual and family case studies, some of well-known personalities, others whose story has become neglected through the decades. Although divided by nation, social class, political outlook and denomination, they were united in their desire to Fight the Good Fight. Families in War (The Chavasse Family and The Brocklesby Family). I have selected the biographies of Lilian Hayman and Pastor Pieter-Jozef ‘Jef’ Dergent to share with you in this article. I found their stories particularly interesting, moving and harrowing in equal measure. It also transpired that their stories were interconnected (although Lilian and Jef never met!). Both were united by the strength of their own faith and sense of religious duty, heightened by a backdrop of global conflict. 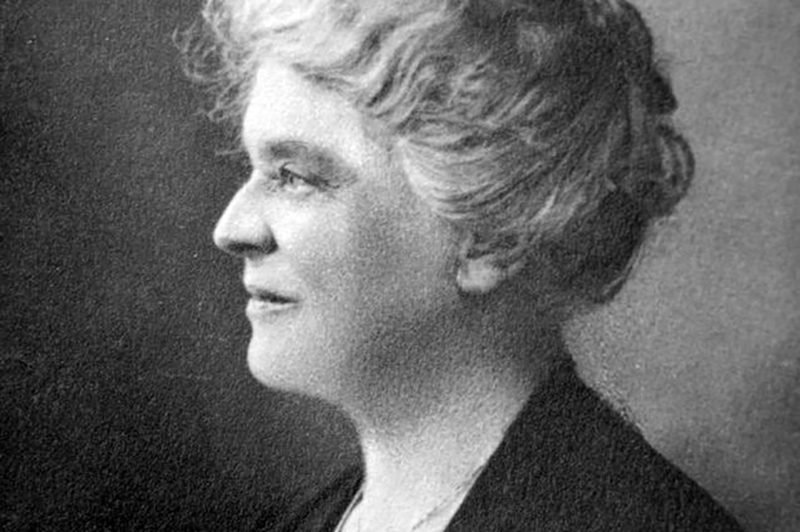 Lilian Hayman. Image courtesy of Norman Ching. Lilian Hayman’s story appears in the ‘Women in War’ section. Lilian was a Bristol-born surgeon’s wife who ran a boys’ Bible class in Brighton and then from her home in Bournemouth, Dorset (from about1912). In the Imperial War Museum’s Department of Documents there are more than 100 letters written to Lilian by some of her ex-pupils who were now serving in the armed forces. Lilian continued to teach her Bible classes until her death in 1944, aged 80. Pastor Pieter-Jozef ‘Jef’ Dergent. John Broom’s own collection. He was considered by his parishioners as a man of the people, who took care of children and the infirm. He set-up a Gregorian singing choir and was holding harvest time rehearsals in the church. Priests were considered by the Germans to be dangerous partisans, capable of inspiring resistance from the Belgian people. Four priests hid in a well for 3 days and then left Aarschot in disguise on the night of 23 August. The dean of the town was held prisoner as a partisan. When the Germans searched Jef’s house, old gun cartridges had been found in a storage room. Jef was kept under arrest in a room in his house and then released on 20 August. However, he was now under suspicion of subversion. Following his release, Jef made the courageous decision to take 3 wounded men, by cart, to Aarschot where the Damien Institute, former home to the Fathers of the Sacred Hearts, had been converted into a Red Cross field hospital. Jef and his driver set-out at 8am on 26th August, safely depositing their wounded at the hospital later that morning. One of the fathers asked Jef to stay but he refused, wishing to return instead to his parishioners in Gelrode. A decision that would place his life in grave danger. Whilst crossing the Market Square in Aarschot, Jef and his driver were arrested. Both were imprisoned in City Hall until 5pm the next day. Afterwards, Jef was kept outside the town’s church where inside, there were 3,000 prisoners. Jef was subjected to violent physical attacks by the Germans as they tried to get him to renounce his faith. He was stoned, beaten, bound and prisoners were encouraged to urinate on him. Jef was then moved to a nearby house, Blykershuis, 200 yards from the church. Behind the property, he was killed with 2 rifle shots and thrown into the river Denier. His naked body was found two days later by Red Cross volunteers, 5 kilometres from Aarschot. Identification had only been possible because of a watch discovered inside his tunic that was discovered floating near the body. The British and American press widely reported Jef’s murder. His death and the circumstances that led to it, saw him elevated to the status of martyr. The exact cause of Jef’s death was not confirmed until1948 when his body was exhumed in order to carry-out forensic tests. It was revealed that he had indeed been shot twice, in the head and through his vertebra. Following a special ceremony in Gelrode churchyard on 4th September, 1949, Jef was reinterred. Lilian Hayman used Jef’s example of self-sacrifice and unwaivering commitment to his faith as a lesson to her boys’ Bible class in Bournemouth on 28th January, 1915. Lilian compared his betrayal with that of Jesus by Judas Iscariot. (Ibid p.140). 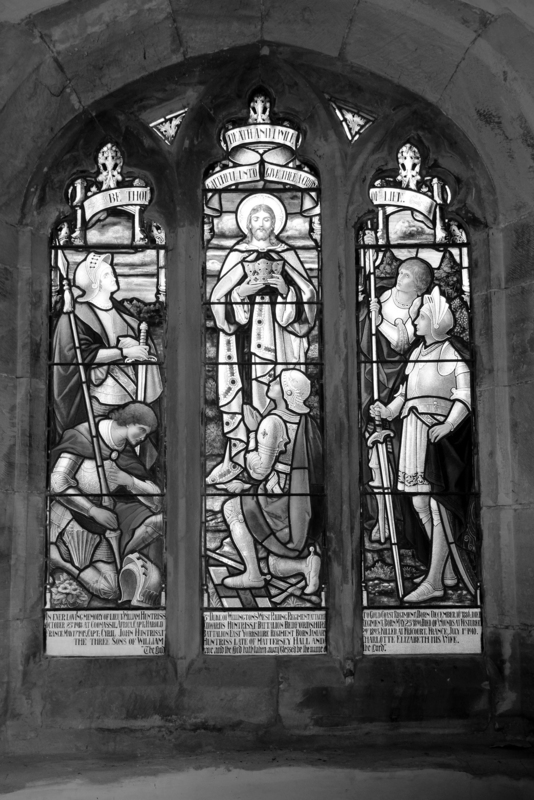 Listen to John on BBC Radio Solent (October, 2014) discussing the Stratton War Memorial located in Stratton, near Dorchester, Dorset. Southampton-based Vintage Hair Lounge, is one of southern England’s leading providers of vintage hair styling and make-up. Founded in 2010 by mother and daughter team, Gloria and Sharon Holloway. Sharon originally worked as a top criminal barrister but retrained, in the early 2000’s, to work as a hair and make-up artist in film, television and theatre. Gloria has been a hairdresser all of her life, spending many years as head of hair and beauty at Isle of Wight College. In 2015, I had the privilege of interviewing Gloria at the vintage extravaganza that is, Goodwood Revival. Gloria has had a long and illustrious career in the hair and beauty industry, spanning over 5 decades. I am delighted to share with you here, highlights from my interview with Gloria. It was an excellent 2 year training scheme. We were taught to do everything ‘properly’, paying particular attention to historical accuracy and techniques. Unfortunately, in the year I finished my course, the BBC raised the age they employed training academy graduates, from 18 to 21. I was very disappointed that I couldn’t begin working for the BBC straightaway and would now have to wait 3 years to put my skills into practice. We opened the salon in 1962/63. I really enjoyed working in a salon environment, chatting with customers and finally getting to use the skills I learned at the BBC. The 1960s was also a very exciting time to be a hairdresser. Hairstyles were changing so fast. Clients became more adventurous with their choice of cut, colours and styles. When I first started working, ‘beehives’ were very popular. British Pathe film, ‘Luxury Hairdressers’ (1964). Uploaded to You Tube, 13.4.2014. Gloria’s beehive updos are now legendary amongst her Vintage Hair Lounge clients. Quite simply, Gloria is the Queen of Beehives. Afterall, Gloria learned her techniques first-hand, back in the 1960s. In the last few years, Gloria has seen the beehive hairstyle make a comeback. This is thanks, in part, to being popularised by a number of celebrities from the entertainment industry. British singer, Amy Winehouse, performs at the Glastonbury Festival 28th June, 2008. AFP Photo/Ben Stansall. Amy’s iconic hair style was a modern-take on the 1960s beehive. British singer Adele was also a fan of the beehive hairstyle. 24th February, 2013. Credit: Jason Merritt. A traditional beehive doesn’t have a French pleat! A common mistake with modern-day versions. The hair should be smoothly swept upwards, blended at the top and sides, it should also be teamed with a fringe. Backcombing is the key to a really good beehive. Dressing hair properly was very important in the 1950s and 1960s. In the 1950s, hats were worn high on the head with hair in a French pleat. In the 1960s, Vidal Sassoon liberated women’s hairdressing. Haircuts were less complicated and a modern-take on the 1920’s ‘bob’ became popular too. Hats were still worn in the 1960s but less fussy and not so old-fashioned. In the Swinging Sixties, young people liked wearing berets and ‘baker boy’ hats. I used a lot of ‘Plix’ by L’Oreal setting lotion in the salon. I also remember creating the unusual ‘cottage loaf’ hairstyle quite a lot. Advert for Plix setting lotion by L’Oreal. The setting lotion of choice for professional hairdressers in the 1950s and 1960s. When I teach 1960s hair styling techniques on courses at Vintage Hair Lounge, I am very particular about backcombing. Nowadays, backcombing is often taught incorrectly. If not done properly, the hair will become tangled and impossible to work with. Each section of hair should be backcombed in stages all the way from root to tip and in one direction. Don’t drag the hair. This method ensures that you create strength and structure in the hair. This gives you a strong base from which to build your style. Backcombing is important when creating 1940s Victory Rolls too. You don’t need rollers to create them, just backcomb, control and shape the roll. Miss V. Neels of Southsea, Hampshire works on a model to create the ‘cottage loaf’ hairstyle during a teen hairdressing competition at the Park Lane Hotel, London. 25th April, 1960. British hairdresser Vidal Sassoon (1928-2012) creates a long bob with a soft fringe for actress Janette Scott (b. 1938). 4th January, 1963. British Pathe film ‘Artists in Hair Styles’ (1962). Uploaded to You Tube 13.4.2014. Beehive hairstyles emerged in the late 1950s, peaking in popularity during the early 1960s. Although, according to trendsetting booklet, with it: trends for ’63 (1962) : ‘Out for the with-its are bouffants and beehives. Out, too, is back-combing: it’s harmful to the hair. In are blonde and light brown shades to tone with the natural look of the new fashions’ (p.19). Also in the early 1960s, new setting lotions, hair sprays and colourants began to emerge for professional as well as amateur home stylists. Hair spray had been around since the 1940s but by the 1960s it was mass-produced and very cheap. Colouring your hair at home, in a wider range of shades than before, also become a reality. I found a wonderful article, ‘What it’s like to colour your hair’, in my vintage magazine collection. The article appears in a popular British weekly, Woman, (11.3.1961). Unlike today, in the early 1960s, there were only 2 options for colouring your hair at home, temporary water rinses and semi-permanent rinses. Permanent tints had to be done at a salon. A selection of popular 1960s hairstyles. Images from my own private collection of magazines, Woman (March, 1961) and Woman’s Day (April, 1964). Gloria Holloway during the 1960s. All images courtesy of Gloria Holloway. By the time the college approached me, I was managing 2 salons on the Island. I thought that the new department at the college was an exciting development in hairdressing education. I had always enjoyed teaching in my salons. I accepted the position at the college, initially working there part-time. When I started at the college there as no in-house salon but eventually I set one up. I was Head of Department and Head of Student Services at the college for 26 years. Until the end of the 1980s, Gloria was the owner and innovator of 4 Isle of Wight salons (Marina Dawn, Monroe Hair). Today, Gloria is still a highly regarded lecturer and trainer in hairdressing, continueing to work closely with hairdressing training providers in both college and salon environments to improve industry skills. Hairdressing is a fantastic career! It allows you to be creative, meet new people and travel the world. It is never too late to master the skill. It is a wonderful thing to be able to make someone ‘feel good’ about themselves by simply doing their hair nicely. When Gloria and Sharon started Vintage Hair Lounge, in 2010, they had a salon in Southampton High Street but in 2012 they closed that salon. Going forward, this enterprising and dynamic duo, now operate their business, predominantly, as mobile specialists and trainers in vintage hair and make-up. Their HQ is based at Southampton’s Solent Business Centre, facilities include an in-house photographic and training studio. 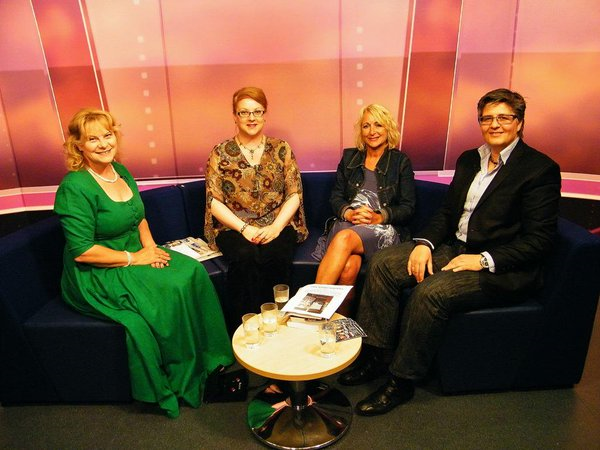 That’s Solent TV, ‘Talk Solent’, chat show, pictured (L-R) presenter, Shan Robins, myself, Gillian Tully (CEO of Film Expo South), Sharon Holloway (Co-Owner of Vintage Hair Lounge). November, 2015. There are many unique aspects to Vintage Hair Lounge’s business model. It comes as no surprise that education and training still remains at its core. Gloria and Sharon run courses for both professionals and the general public. Keep an eye on their website for forthcoming courses as they sell-out very quickly! Click here. ‘Vintage Hair Lounge to be stocked in the British Museum’. Film by That’s Solent TV. Uploaded to You Tube 20.1.2016. Vintage Hair Lounge also has a sister company, VHL Distribution an independent cosmetics distributor based in the UK. VHL Distribution has recently formed new partnerships for distribution in Europe with Australian based brand Eye of Horus Cosmetics (Twitter: @eyeofhorus_mu), and French brand Féret Parfumeur (Twitter: @FeretParfumeur) for distribution in the UK. Other heritage brands on VHL Distribution’s portfolio include: Papier Poudré Limited (Twitter: @papierpoudre) and Barba Italiana (Twitter: @barbaitalian #barbaitaliana). These beautifully packaged, extremely high quality, heritage brands can be found on-sale at vintage retailers, salons and barbers, museums and gift shops. A selection of these products can also be purchased at Vintage Hair Lounge’s online store. Exciting times are ahead for VHL Distribution (see film above). The British Museum has recently selected award winning Eye of Horus Cosmetics to be sold in the gift shop, later on this year, during their major new exhibition, Sunken Cities: Egypt’s Lost Worlds which opens in May. Teaser trailer for the British Museum’s forthcoming blockbuster exhibition, Sunken Cities: Egypt’s Lost Worlds. Uploaded to You Tube by British Museum, 4.01.16. Regular readers of Come Step Back In Time will know that interest in Egyptology is currently at an all time high. In July 2015, British archaeologist Nicholas Reeves, published a paper that claims Tutankhamun may not have been alone in his burial chamber. A series of ultra-high-resolution images of King Tut’s tomb (subsequently designated KV62) have revealed what is believed to be the outlines of two doorways, previously blocked and plastered over. Reeves has suggested that behind these hidden doors there may be a lavish secret tomb belonging to the legendary Queen Nefertiti (the 14th century wife of Akhenaten, step-mother to Tutankhamun). Tutankhamun died at the age of 19, and it is thought that, due to his unexpected death, he may have been buried in a chamber of his step-mother’s tomb. Continued interest in Egyptology ensures that Egyptian Revival products, such as Eye of Horus Cosmetics range, will remain popular with beauty professionals and the general public alike. It is interesting to note that Eye of Horus Cosmetics range of illuminating eye makeup is actually based on sacred formulas passed down from the ancient Egyptians. Eyeliners in the range are all made with natural waxes and oils and the incredible organic Moringa Oil, a tell-tale product found in Tutankhamun’s tomb. Check out the entire Eye of Horus range at Vintage Hair Lounge’s online store. Follow VHL Distribution on Twitter @vhldistribution. A short while ago, I received a Press Release from PR Matters that was so exciting, I just had to share it with you here. New research, conducted by retired 18th and 19th century metallurgist Dr Richard Williams, has proved that a cooking pot in the collection of the Ironbridge Gorge Museum Trust is the oldest known coke iron casting in the western world. Without using coke to smelt iron, there would have been no Industrial Revolution; the supply of wood was simply not extensive enough. It has previously been assumed that Abraham Darby I (1678-1717) invented the process because wood was already becoming increasingly scarce and coke was therefore generally more economic, but Dr Richard Williams has established that it was, in reality, all about cooking pots. Dr Williams has been working on behalf of the Ironbridge Gorge Museum Trust as a member of the museum’s Birmingham Advisory Group. The work, published in the journal Historical Metallurgy shows that Abraham Darby’s genius was more commercial than technical (as previously thought) and that he actually first smelted iron with coke, as opposed to charcoal from wood, for just one application. ©Ironbridge Gorge Museum Trust. An extract from Abraham Darby I’s original 1707 patent for casting iron bellied pots. In 2013, I want on an incredible press trip to Ironbridge, Shropshire. I cannot tell you what an astonishing heritage site it is. There are 36 scheduled monuments and listed buildings cared for by The Ironbridge Gorge Museum Trust, spread over a 6 square kilometre site. The Trust also operates 10 museums which collectively tell the story of the birthplace of the Industrial Revolution. These museums are: Blists Hill Victorian Town; Enginuity; Coalport China Museum; Jackfield Tile Museum; Coalbrookdale Museum of Iron; Museum of The Gorge; Darby Houses; Tar Tunnel; The Ironbridge and Tollhouse and Broseley Pipeworks. For anyone interested in social or living history, Ironbridge is a must! The cooking pot which has been the subject of Dr Williams findings, is part of the Coalbrookdale Museum of Iron collection. The unique cast iron pot, dated 1714, inspired Dr Williams to wonder how it had been cast in order to have exactly the right metallurgical structure? He saw the relationship between the only patent (see image above) that Abraham Darby filed – about moulding such pots in sand – and his modified blast furnace. It had been previously thought that the two inventions were entirely independent, but Dr Williams realised that Darby’s patent would only work if the liquid iron he used to pour into his moulds was made with coke.It would not have worked with the previously universally used charcoal. Darby’s new process was much cheaper than the competitive one, which was most effectively practised on the continent, with a consequently large importation of pots into England. On the continent they used charcoal but, in order to get the right structure in their iron, Dr Williams recognized that they had had to pour their metal into moulds that were very hot, thus being obliged to use an expensive moulding process where the sand grains were bound together with clay, the so-called loam process. Darby’s patent specifically said that he was going to use no clay and his moulds could thus not be heated. Dr Williams explains that to make most castings, the composition of the iron had to be such that a grey structure resulted rather than a white one, but this was much more difficult when the casting was thin, as with a pot, because the metal cooled more quickly than with a thicker casting. The iron had to be high in silicon to come out grey, something that was very difficult to achieve using charcoal. But coke did it much more easily and this Abraham Darby already knew, from the work of others before him. He clearly knew it some years before he first set out to make iron himself, because his patent was published in April 1707 and he did not start his coke blast furnace until the end of 1708. It has not previously been realised – at least in the UK – that moulds used to be regularly heated. Dr Williams could find no reference to it in the English language. There are however many references to it in the French encyclopaedias published in the second half of the 18th century, of which the Encyclopédie of Diderot is the most famous. To prove his thesis, Dr Williams examined a number of 17th and 18th century pots made with the loam process at the Maison de Metallurgie in Liège. He deduced that all pots bear characteristic markings that establish how they were made and in his paper he demonstrates that the pot in the Ironbridge Gorge Museums, dated 1714 (just six years after Darby’s first blast furnace came on stream) must have been cast using an iron made with coke. With no one else known to be making coke iron at the time, it could only be a genuine Abraham Darby product, the oldest known coke iron casting in the western world. To begin with, coke iron was only of economic use for the manufacture of cooking pots, but the profit from this activity allowed him and his descendants the time to develop the coke blast furnace for all the other applications for which it became suitable. His first furnace produced just four tons per week. In the world today, more than one billion tons of iron comes out of coke-fired blast furnaces each year. The Coalbrookdale Company was formed in 1709 by Abraham Darby I (1678-1717), an iron-master who had moved to the region from Bristol in the previous year. His original intention was to lease an ironworks with a view to setting-up a brass foundry – he had been experimenting with making brass pots since 1707 which led to his patent for casting iron bellied pots in dry sand. He leased the Furnace at Coalbrookdale in 1709 from landowner Basil Brooke of Madeley and his wife Elizabeth, beginning blasting in January of the same year. Until the latter part of the 18th century, the most important industry in the Ironbridge Gorge was coal-mining – the first step on the road to the birth of the Industrial Revolution in the region. Other coal-using industries utlising the area’s rich natural resources were: lead smelting; tar boiling; pottery making and brass manufacturing. The Tar Tunnel at Ironbridge is open to the public and well-worth a visit. In 1787, miners digging in the area struck a spring of natural bitumen (treacle-like black liquid) which has seeped out of the walls and formed into puddles for over two hundred years. It was money from coal that funded the first ironworks in the area. Although now a haven of tranquillity, in the 18th and 19th centuries, the area resembled Dante’s Inferno, a scene which artist Philip James De Loutherbourg (1740-1812) captured so brilliantly in his iconic painting Coalbrookdale by Night (1801). Iron Works at Coalbrookdale by Philip James De Loutherbourg (1740-1812) from an engraving by William Pickett. ©Ironbridge Gorge Museum Trust. De Loutherbourg was a theatrical designer who worked for playwrights such as R.B. Sheridan (1751-1816) and David Garrick (1717-1779). His painting, Coalbrookdale by Night (1801), depicting the raging Bedlam Furnaces in Madeley Dale, Shropshire, a little further downstream from Ironbridge, recreates the iconic scene of fire and brimstone that we now associate with the birth of the Industrial Revolution in Great Britain. The three surviving groups of iron furnaces mark these different phases in the local iron industry – the earliest, the Darby Furnace at Coalbrookdale …… Bedlam Furnaces (begun 1756-7) were the first of the great new Industrial Revolution furnaces, experimenting with new forms of power, while the Blists Hill Furnaces, begun in c.1832 and closed in 1912, signal the move away from water as a source of power, and eventually the end of smelting in the Gorge. ..adhering strictly to the ideals of self-discipline, frugality and simple faith, attitudes which extended into the conduct of their business. As members of the Society of Friends, Quakers formed a close-knit group, distinct in their way of dress and habits, and tending to socialize as a group. Many of the visitors who came to Coalbrookdale were Quaker associates, and the large houses at Coalbrookdale became a focus for this society. The houses were built close to the works, but looked out over a more pleasant view of trees, pleasure gardens and a pool with a small decorative iron bridge. For most of their history the houses were occupied for relatively short periods by family members or by works managers; often, as in the case of Abraham Darby III, while they built or altered finer houses elsewhere in rural settings. Carpenters Row is an example of company housing: built c.1783, it is a terrace of eight cottages, each with a downstairs parlour with a range, a tiny pantry and a bedroom above….Carpenters Row would have provided a relatively good class of accommodation. The molten iron from a blast furnace could be poured direct into sand moulds to produce cast iron goods or cast ingots called “pig iron”. The pig iron was then either melted and cast in a foundry or purified to produce wrought iron that could be shaped by hammering and rolling in a forge. (Extract from text panel at the site of the Old Furnaces, Upper Works, Coalbrookdale, Ironbridge Gorge Museum Trust). Isle of Wight based author, Joan Ellis. Image copyright Joan Ellis. I met independently published author, Joan Ellis, in August last year whilst doing one of my regular guest slots on That’s Solent TV’ s chat show, Talk Solent. The show was presented by Shan Robins and we were also joined by award-winning special effects designer, B Jones. It was a fascinating discussion covering a wide range of topics, everyone contributed their well-informed opinions on the topics of the day. I was honoured to share the sofa with such talented and creative women. Before leaving the studio that day, Joan pressed into my hands a copy of her latest book, I am Ella. Buy me. (2014). Joan knew that I was retro-obsessive with a particularly fondness for the 1980s (well, it was, afterall, the decade of my ‘yoof’!). Joan wondered whether I would like to feature it on Come Step Back In Time? I was delighted to accept. Let me first introduce you to Joan. Born in London, Joan has had a long and successful career in PR and advertising. During the 1980s, Joan was a copywriter in several top London advertising agencies (Ogilvy, Lowe Howard- Spink, Banner and Arc Worldwide amongst others). Never one to let the grass grow under her feet, Joan has also set-up a comedy club where she wrote and performed, even appearing on the same bill as Jo Brand. Once. Joan’s extensive knowledge of Advertising and PR has seen her lecture at University level and she even taught comedian Noel Fielding. He learned all he knows about advertising from Joan who encouraged him to showcase his creative talents on a wider stage. The rest, as they say, is history. Joan now lives on the Isle of Wight with her daughter and husband. She often appears on television and radio discussing her career as well as offering advice to aspiring authors. Joan also performs a one woman, semi-autobiographical, show ‘A Woman’s Wit, Wisdom and Pratfalls’. I was writing for eight to 10 hours a day on different briefs so I’d be changing my style and tone of voice depending on the product and the audience. It was fantastic training for becoming an author because you’re getting inside the heads of different audience types as well as the discipline of meeting a deadline and that creative process of taking things in different directions and thinking of things in different ways. Joan, the 1980s career girl. Image copyright Joan Ellis. …I became the rarest of beasts in Adland in the early 1980s, a woman. I am Ella. Buy me. will transport you back to the 1980s. Joan draws upon her own experiences working in advertising in London during this period and brings Ella’s fictional world vividly to life. A city world of Porsches, tailored clothing, big hair, inflated salaries and fine-dining. This is Thatcher’s Britain, where ‘greed is good’ but morals are bankrupt and sexism in the office, rife. This is the backdrop of Joan’s novel, a brilliant expose of 1980s life and Adland culture. I am Ella. 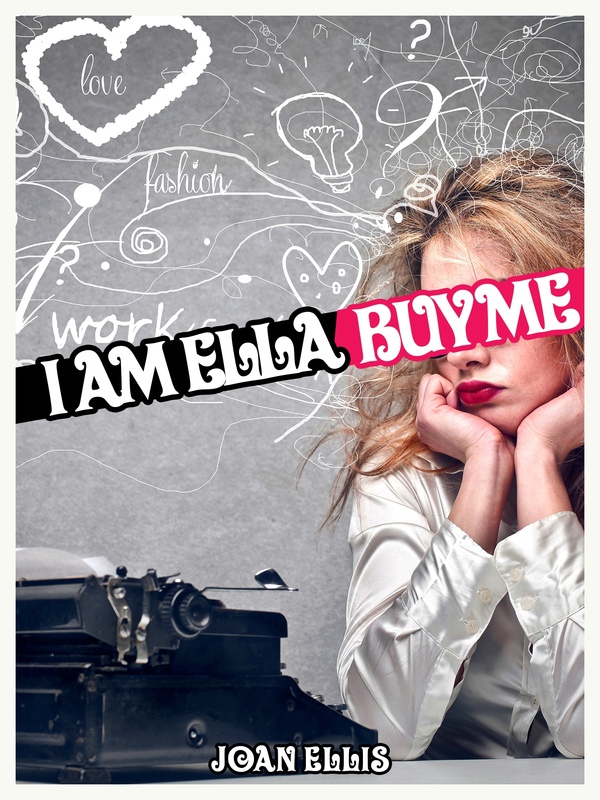 Buy me.’s main protagonist is Ella David, a rare beast – a woman in a man’s world. Ella must not lose her head as she has a mortgage to pay (at 9%!) as well as her ill mother’s rent. There is no Trust Fund to catch Ella, she is at the mercy of her sexist and predatory boss, Peter Richards. Peter, bored with his ball-clicker, demands something or someone new to play with, Ella finds herself battling more than just fat thighs. Can love help her go from a girl in the firing line to a woman calling the shots? Fans of ‘Mad Men’ will enjoy meeting Ella. She’s Peggy meets Bridget Jones. During the 1980s, anyone, male or female, working in advertising was a precarious way to make a living. If you were a woman, then the stakes were very high indeed. Being propositioned, fired, hired, rehired and having to hustle on a regular basis were all part of its culture. The route to the boardroom was a rocky and compromising one. In I am Ella. Buy me., Joan, has drawn upon her own experiences and has created the 1980s Adland culture very well indeed. Although I am Ella. Buy me. is not autobiographical, there are many similarities between Ella’s and Joan’s experiences in advertising. More amusingly, on one occasion Ella must pretend to be a Tom cat called Marmalade in order that she can pen letters from him. In real life, Joan once had to create an advertising campaign for pet food in which a cat vocalises his thoughts. The cat’s voice in Joan’s commercial (see above) was, of course, male! I am Ella. Buy me. is a terrific read, the perfect accompaniment on a long train journey or curled-up by the fire in a holiday cottage. As an experienced professional writer, Joan has skilfully offered her readers an amusing slice of 1980s nostalgia whilst still managing to create three-dimensional characters that you actually care about. To purchase copy of I am Ella. Buy me., click here. Follow Joan on Twitter @JoanSusanEllis .